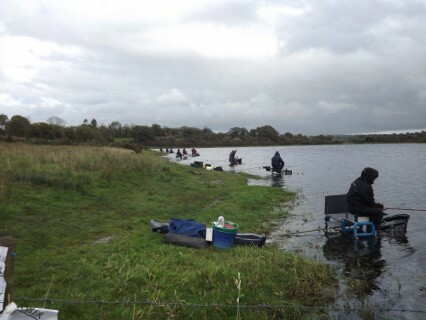 As usual there was a really good turnout for this popular match with about 80 anglers booking tickets, but with the water low and clear and hardly any flow meant it was going to be really tough and so it proved with only one angler breaking double figures. 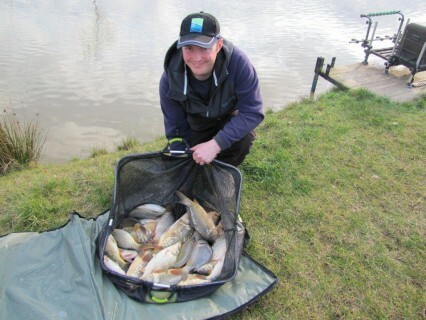 Maver Bait Tech angler Alistair Ogilvie drew peg 18 just above Wigstons bridge and fished bread punch catching good quality roach at 6mts for 11lbs 4 ozs for 1st overall. I drew peg 38 on Nene parade. The water was so clear I could see my punch crumb on the bottom after I had cupped in. 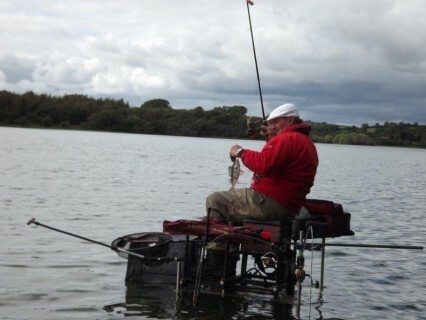 I could even see the fish moving over my bait. 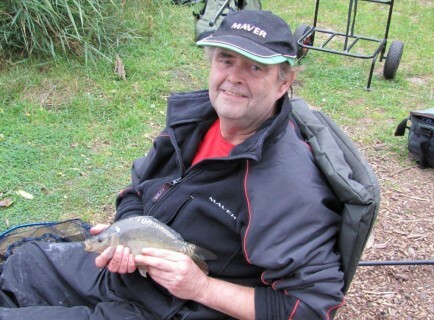 I had an easy match fishing a small 2mm punch of bread over Van Den Eynde punch crumb at about 5 mts out catching 205 small roach for 9lbs 2ozs and 2nd place on the day. 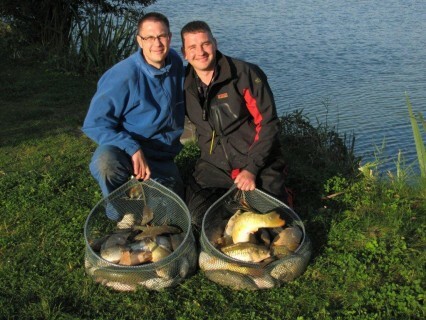 3rd overall with 8lbs 12ozs was J Foreman (J&P Tackle); Steve Clarke (Maver Image) was 4th with 8lbs 2ozs. Pat had booked me for the day. 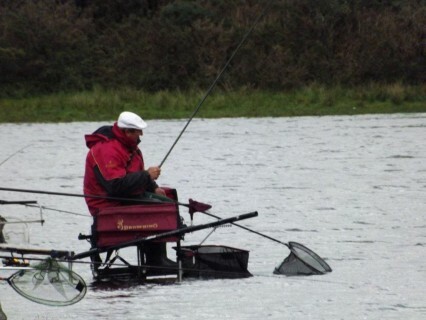 He has been out with me before and is a very good angler. 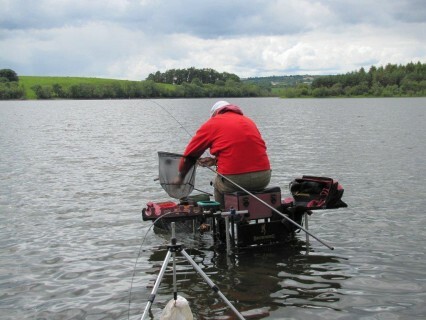 He just wanted to improve his skills at catching silver fish on maggots in winter. 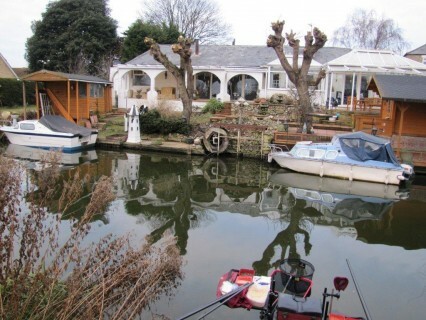 The very popular Cuton Lakes near Chelmsford in Essex was the chosen venue. 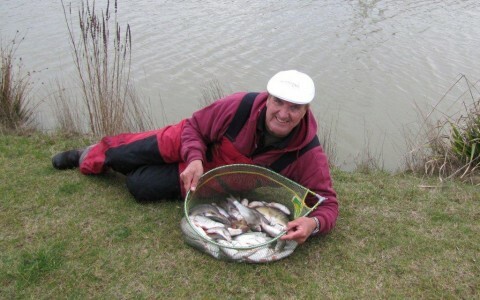 The owner Neil Copeland has worked tirelessly over the last few years to turn it into the beautiful fishery it is today. 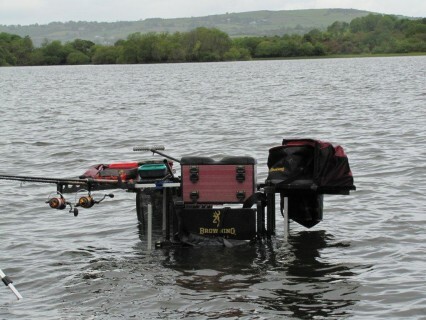 Check out the fishery at www.a12lakes.co.uk. 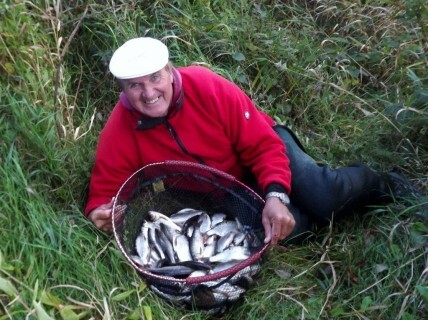 It was a cold autumn morning with the first frost of the year and I thought Pat would be in for a tough day. 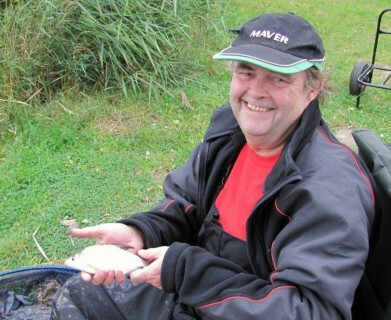 After cupping in some really sloppy Van Den Eynde Supercup with a few pinkies and 2mm hard feed carp pellets at 11mts, with a single red maggot on the hook Pat was soon catching fish mainly small roach and then a skimmer. Then the bites slowed. 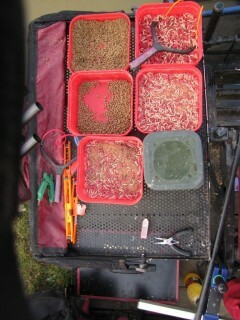 Cupping in again and also loose feeding just a about 6 or 7 big maggots over the top helped keep the fish feeding. 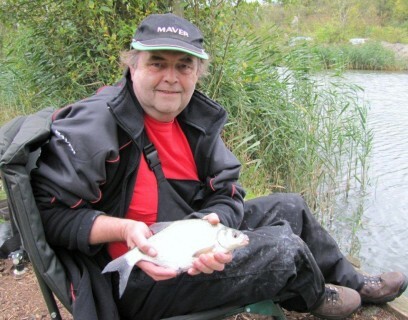 In the last 2 hours the fish really came on as a succession of skimmers, bream, perch, carp and roach came to the net. 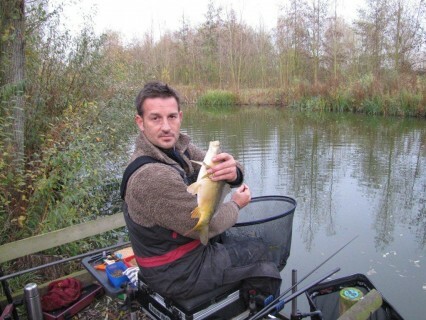 Soft pellet on the hook fooled the last fish of the day which was a 3lb tench. We left the bank just as the light was fading Pat having caught almost 50lbs of fish. 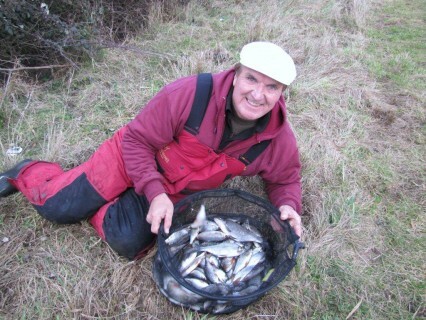 What a fantastic catch of mainly silver fish! 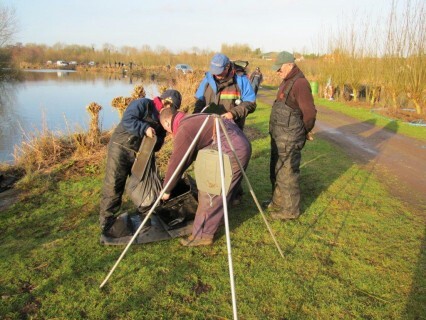 I spent a great day on the Warwickshire Avon last week with Kevin and Pat from Total Coarse Fishing magazine, read all about it in the January issue on sale December 12th. 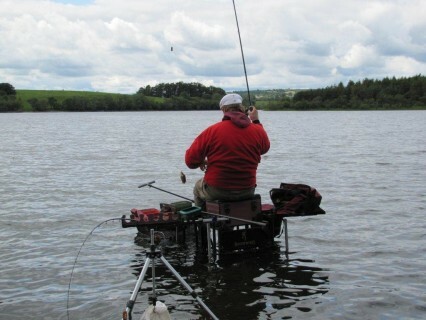 Per-Eric had arranged for me to take him fishing for the day. 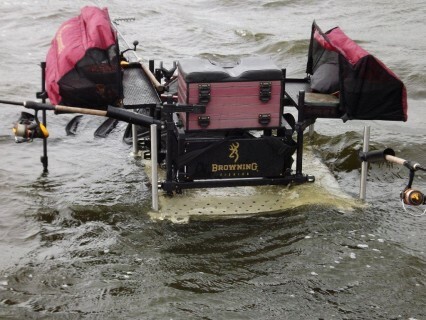 He is a Browning sponsored angler from Sweden and was combining a business trip with the chance to experience fishing a commercial water in the UK. 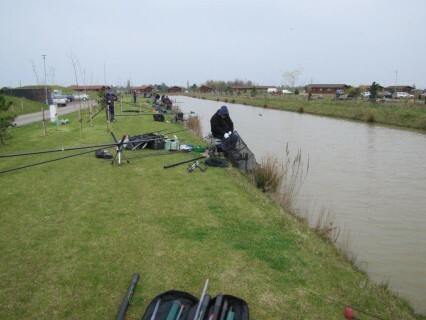 The brilliant Decoy Lakes near Whittlesey in Cambridgeshire was the chosen venue. It was dry, but a strong cool south easterly wind was blowing. I decided one of the more sheltered lakes, 6 Islands would be a good choice. 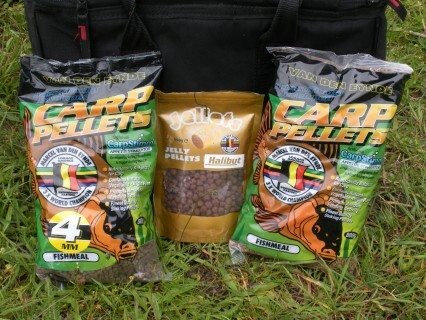 Initial feed was 1 big pot of 4mm and 6mm Van Den Eynde hard feed carp pellets at 10mts with a 6mm Halibut jellet on the hook, loose feeding a few 4mm pellets over the top just to keep the fish coming into the swim. It took a few minutes for the first fish an F1 about 12ozs. 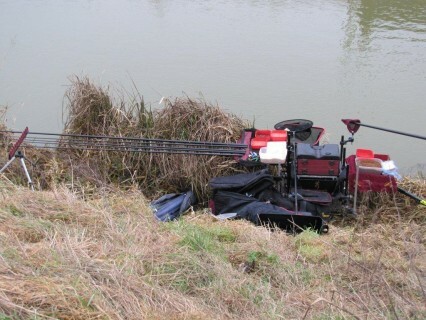 After that it was non stop as F1’s and carp came to the net. 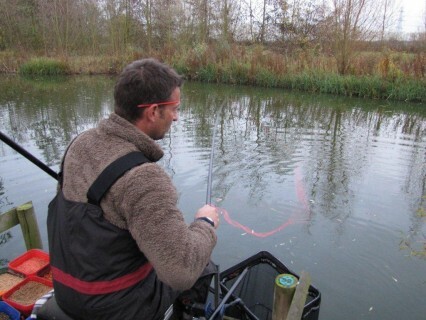 A switch to a piece of worm on the hook always works well as water temperatures drop in the Autumn and so it proved as Per-Eric continued to catch really well. We left the bank at about 4.30 pm Per-Eric having had a fantastic day. 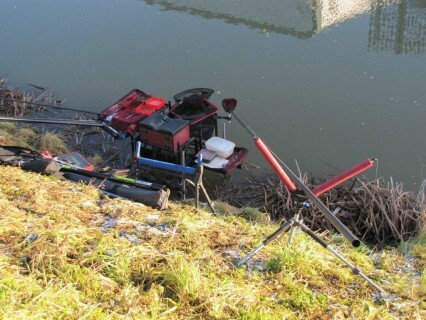 I guess he caught close to 80lbs of fish. John and Dave had booked me for the day. 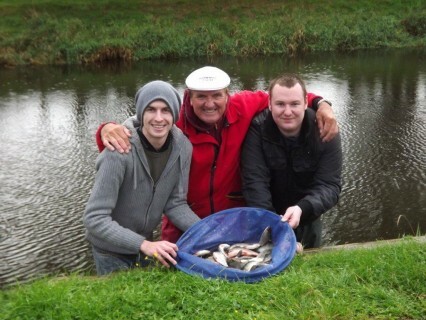 They have both been out with me before and are very good anglers, so I knew I was in for an easy day. 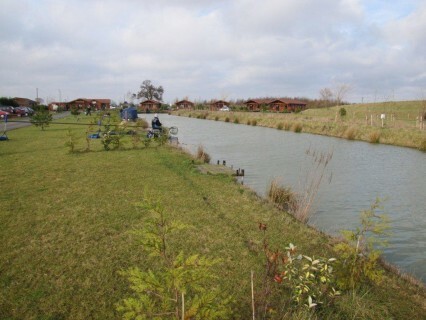 The wonderful Decoy lakes near Whittlesey in Cambridgeshire was the chosen venue. It was a sunny day, but there was a cold South easterly wind, so I decided we would go on one of the strips lakes, Elm, with the wind on our backs. 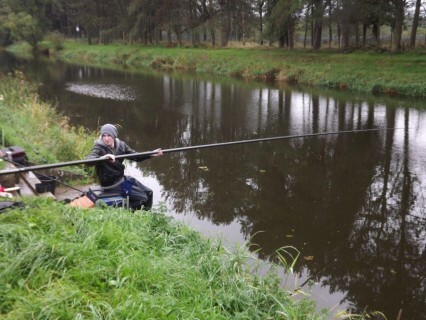 Pole at 10 metres was the chosen method, cupping in 2 big pots of 6mm and 4mm Van Den Eynde hard feed carp pellets, with a 6mm Halibut Jellet on the hook. Dave was soon into fish. John also started to catch but was missing bites. 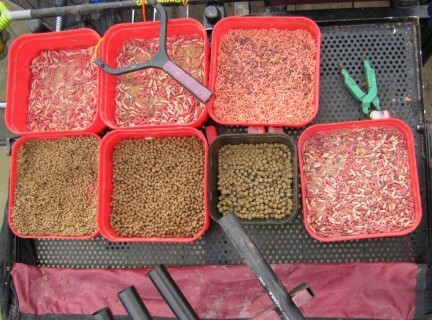 A switch to worm on the hook seemed to be better, loose feeding over the top with 6mm pelets helped to keep the fish interested and the action was nonstop. 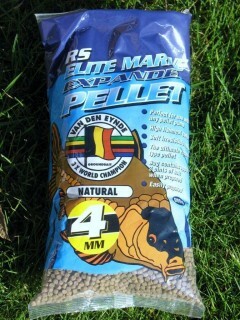 Dave found pellets the best hookbait, while John was bagging with worm. We left the bank at about 4.30 (a promise of a beer in the clubhouse helped). I guess John had topped the 100lbs with 110lbs while Dave had caught about 75lbs. Fantastic weights on a cool Autumn day. This was a special 60th birthday present from Brian’s wife Bev, his daughter Shelley and son Owen. 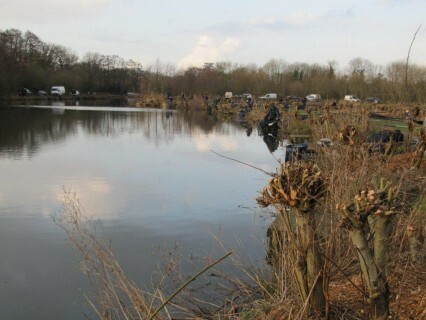 The wonderful Bishops Bowl Fishery at Bishops Itchington Warwickshire was the chosen venue (check out their website www.bishopsbowlfishery.co.uk). 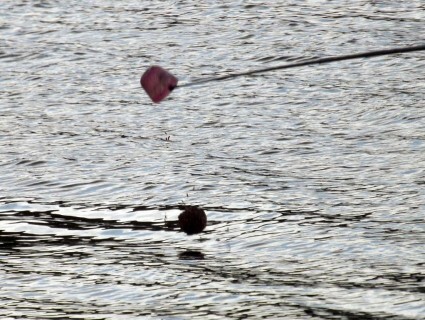 The owner Sean Smart had kindly reserved 2 pegs on Walworth lake. 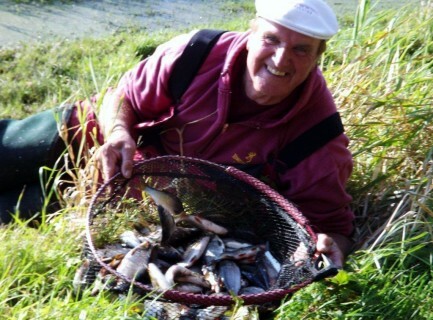 Brian loves to catch silver fish on waggler so this was the chosen method, feeding small balls of fishmeal, groundbait and also loose feeding maggots over the top with single and double red maggots on the hook. It only took about 10 minutes and Brian was into his first skimmer. 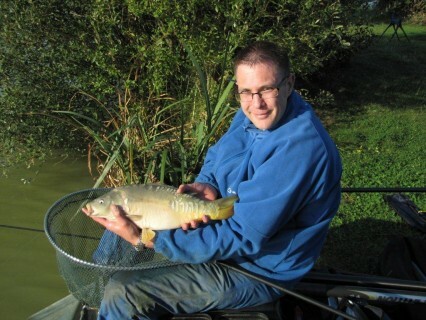 More skimmers and small carp followed, then the rod arched over as a big fish took the single maggot. 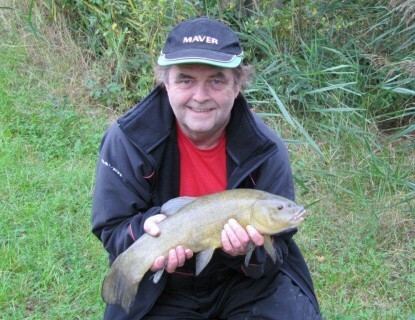 After about 5 minutes it was in the net, a beautiful tench about 4lbs, some big bream followed. The action was nonstop. I took the catch shot at about 4pm. I guess Brian had caught somewhere about 35lbs. John potters has had a brilliant year on the Irish festivals and made no mistake this week winning with 28,94 kg to take the 1000 euro first prize. 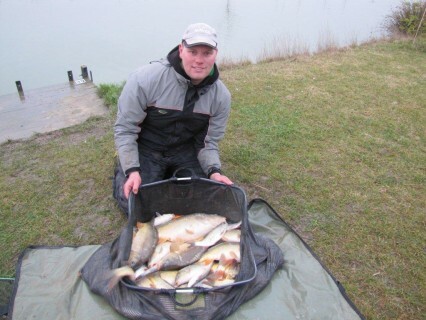 Dutch angler M. Snyders was 2nd with 26,34 kg, with Paul Lee coming 3rd only 20 grams behind with 26,32 kg. I was just out of the main list finishing 9th overall with 22,32 kg. 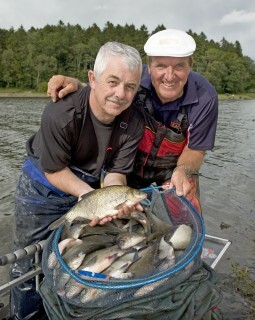 The Carrigallen festival is fished over 4 days on the lakes around the town of Carrigallen in County Cavan. 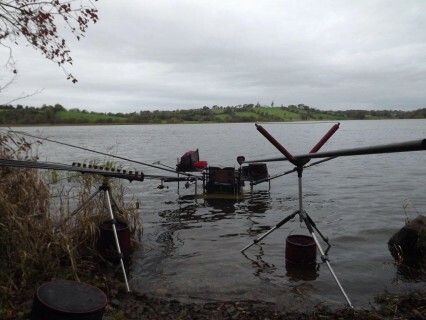 My first day rotation was Rockfield lake. It was a windy day and I decided to fish the pole at 10 mts. 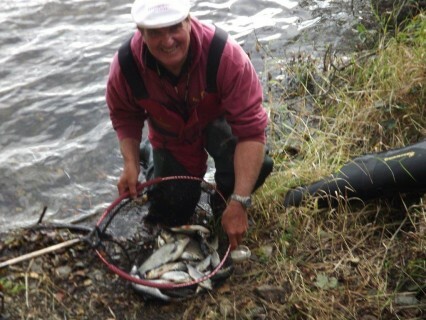 It was really difficult but I managed to win the section with 120 roach and perch for 6,34 kg which was also 4th overall on the day which was won by J Wall with 10,600 kg. My day 2 draw was Tully lake again. 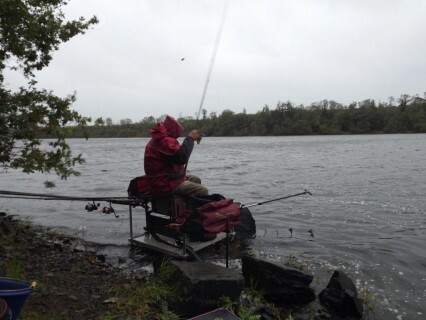 I opted for the pole but conditions were really awful with a very strong South Westerly wind. 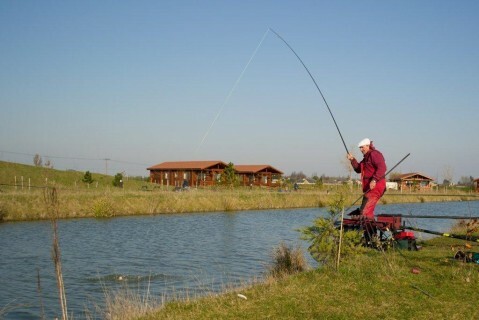 Still I struggled on with the pole at 10mts as the tip was not producing much. 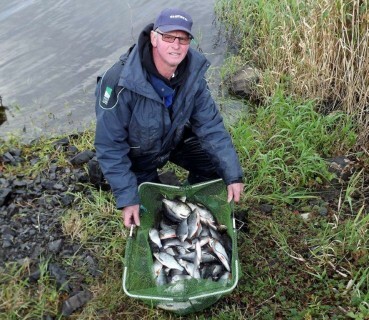 I still managed to win the section with 60 roach for 4,1 kg. Paul lee won the day with 10,92 kg. A poor performance by myself on day 3 on what was really the best section, really cost me from getting into the main list. 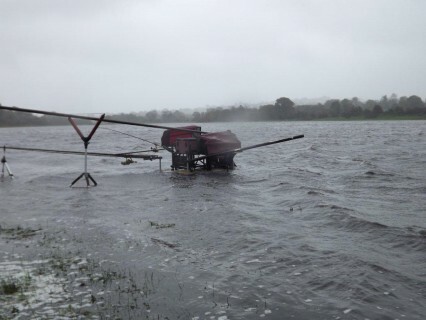 It was again a wild windy day and pole was out of the question. I managed only 2,94kg, Barry Smith won the day with 10,1 kg. Conditions had changed on day 4 with much lighter winds and some welcome sunshine. My section was lower Gulladoo. 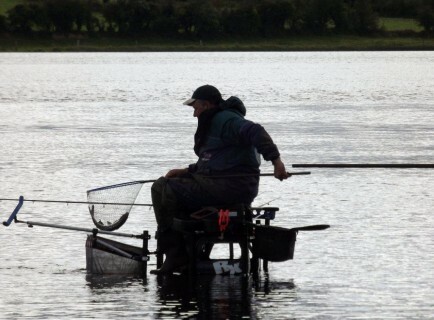 I had finished 2nd overall here in the open on Monday so was really confident that I would catch well on the pole. 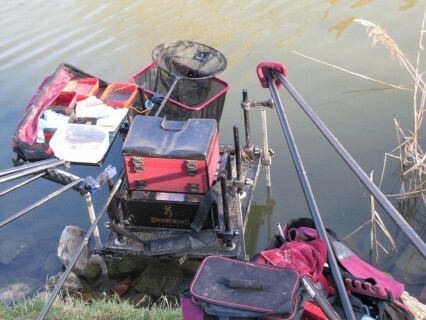 I fished at 13 mts with a 1 gram float and single red maggot on a 16 hook, balling in 6 balls of Van Den Eynde Superlake at the start and then loose feeding casters and maggots over the top catching 140 roach and hybrids on the drop to win the day with just under 9 kg. 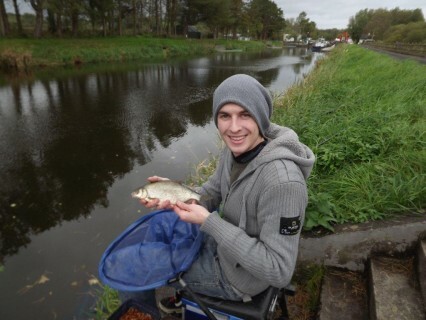 A brilliant consistent 5 day performance saw Dutch angler Leo Koot coming out on top in the Cootehill Festival with a total of 54,450 kg. Running him very close for 2nd place was Kevin Ashurst with 52,230 kg. Paul Leese was 3rd with 50,060 kg. I finished 10th with 41,740 kg. The 3 man team event (Browning Van den Eynde) was won by my team of Kevin Ashurst, Barry Smith and myself with 49 points. 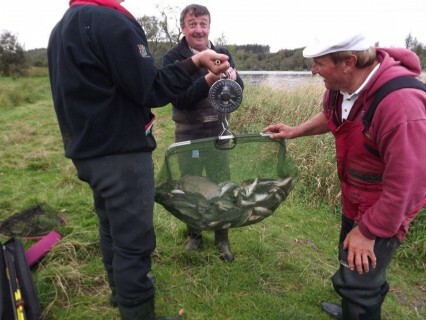 The Cootehill Festival is run by the local residents and is fished on various lakes in the area around the town of Cootehill in County Monaghan in the South of Ireland. 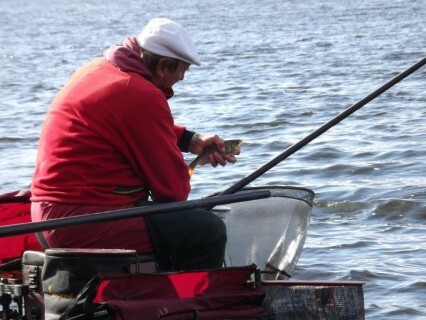 90 anglers fished this year on a section rotation basis. On day 1 I drew on Mullanarry lake. 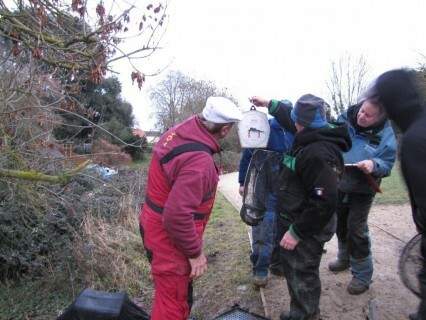 It was very difficult and I caught 40 roach on a combination of pole and feeder for 5,640 kg. Duncan Biddle won the day with 15,540 kg. It was another tough one for me on the 2nd day. 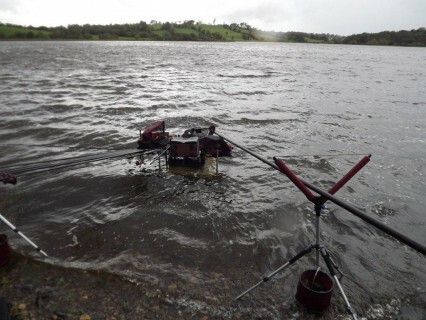 I was drawn on Annaghmakerrig and managed to win the section on the feeder with 2 skimmers and a few roach for 4,300 kg. Steve Sadler won the day with 13,240 kg. Bairds Shore was my day 3 section., I had a good first 2 hours on the long pole catching roach and hybrids but they did not last. I still ended up winning the section with 8,780 kg. 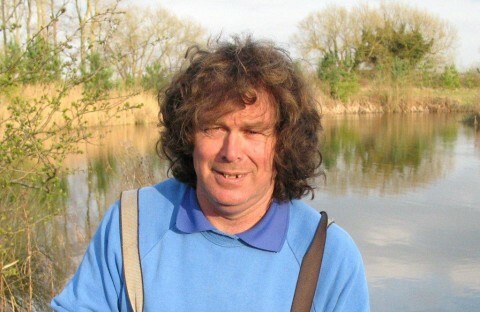 Paul Leese won the day with 15,490 kg. I was on the Caravan Park section of Lough Sillan on day 4. 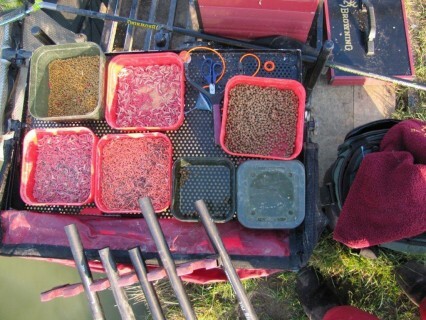 It was solid with roach on the pole line but they were very small and I finished with 250 for 7,300 kg and another section win. A. Pollard won the day with 18,580 kg. The last day was much better for me. 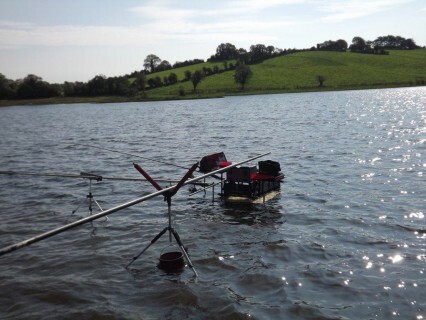 My section was Annasfarney on Lough Sillan and I drew peg 1 where I fished on the pole at 13 mts, catching some good roach, balling in with groundbait at the start and then loose feeding with casters and maggots. I ended up winning the section and was first overall on the day with 15,720 kg. This was a special 21st birthday present from Alan’s mum Lynn and sister Laura. 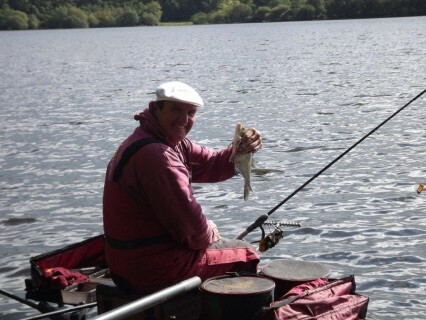 His long time fishing friend William had also come along for the day. 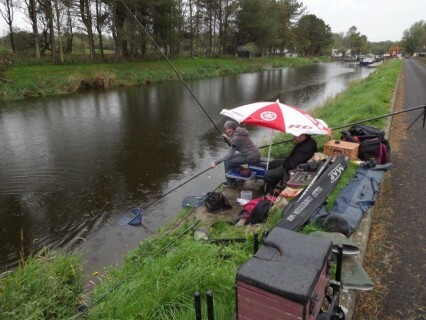 The chosen venue was the Movanagher canal near Kilrea in Northern Ireland. It was a cool overcast Autumn morning with a forecast of rain later. 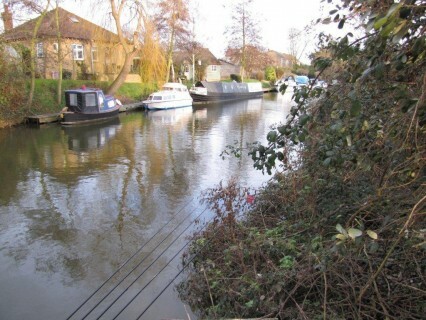 The canal looked in perfect condition: a tinge of colour with a slight flow. 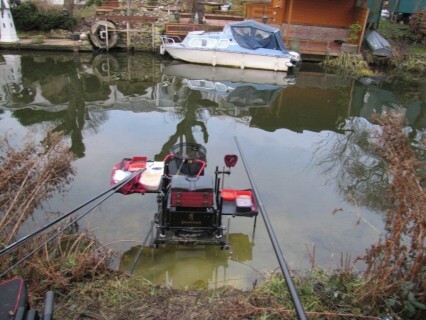 Long pole was the method, cupping in 3 balls of Van Den Eynde Gold pro bream groundbait laced with casters, a 2 gram float, size 16 hook with a single red maggot as hookbait. 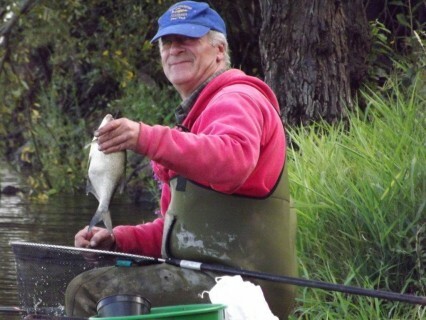 The float buried first cast and Alan was into a good hybrid. Roach and perch followed. 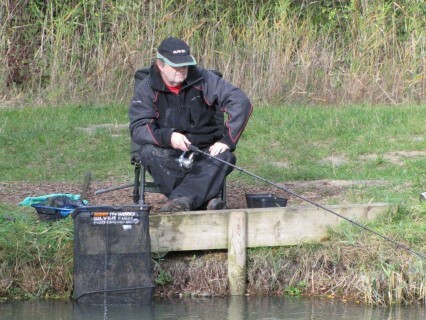 The first hour was all action as fish after fish came to the net. The rain came at about midday and up went Alan’s brightly coloured umbrella. 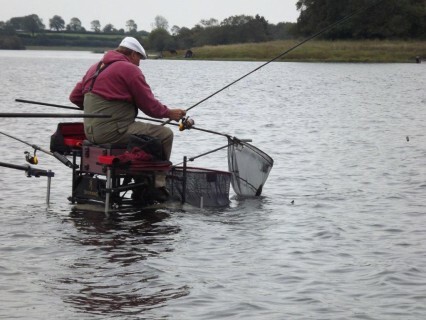 The fishing was tougher but the fish still kept coming. 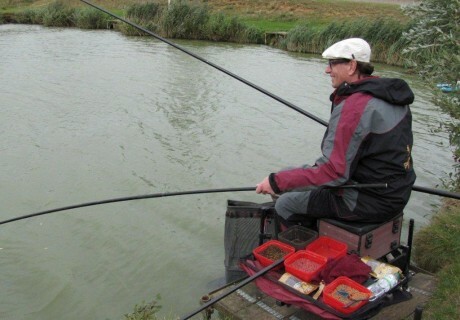 Loose feeding casters over the groundbait helped to keep them interested, while the wonderful picnic hamper that Lynn had packed kept William and myself happy in the rain. We left the bank at about 4 pm. 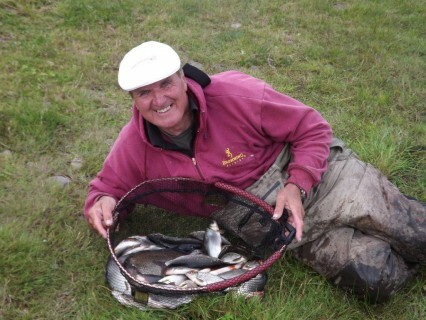 Alan had had a great day and I guess he had caught 50 fish or more for about 14 lbs. It’s raining but who cares? 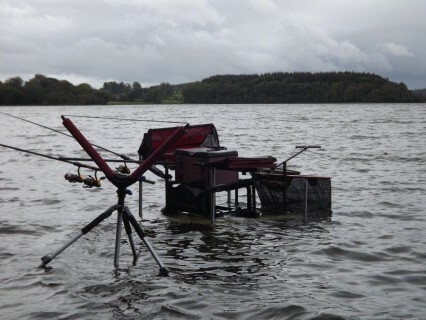 Lough Muckno in County Monaghan must be one of the best roach waters in the South of Ireland. 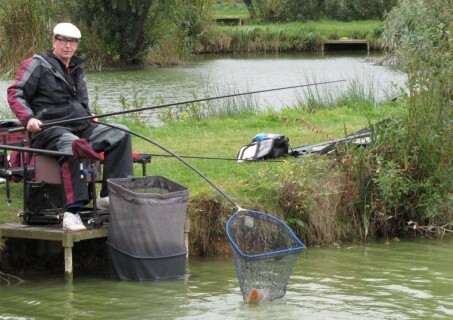 This year 48 anglers were taking part in the annual pairs match. 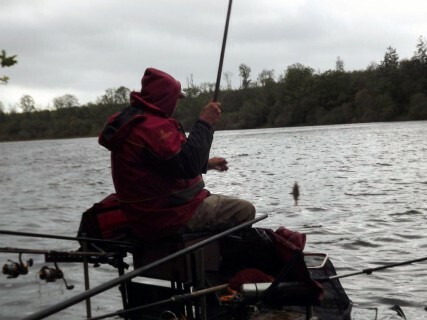 The competition is fished on 5 sections over 5 days with the lowest total section points deciding the winning pair. It was the Dutch / English combination of Willam Van Der Helm and Lol Higgins who came out easy winners. I was paired with Gary Whalley and we finished just out of the main prize list in 8th place. The fishing was great all week with some big individual daily weights. My best day was on White Island day 4. I fished 2nd overall on the day fishing long pole and catching just over 41lbs of hybrids and roach. 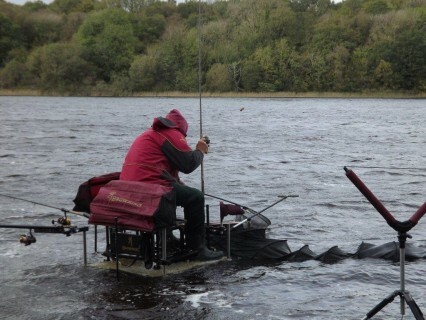 The King of Clubs is a 5 day festival fished in the Arvagh area of County Cavan in the South of Ireland. Kevin Rowles put in brilliant performances all week to finish in 1st place with well over 70 kg. I had a tough week finishing with a total of just over 40 kg. 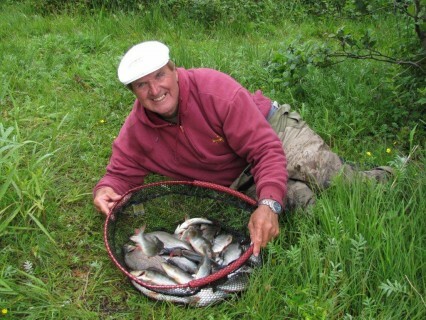 The fishing was still great with the new sections at Killykeen producing some big weights. The Arvagh Festival is an annual event that has been running for many years. 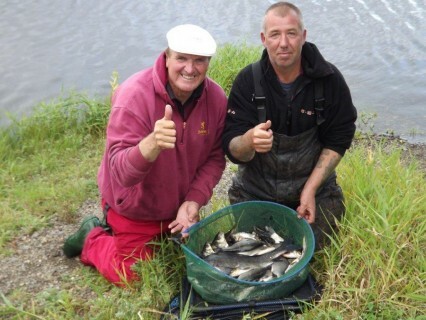 It’s a 5 day competition fished on a section rotation basis on the lakes around the town. Again this week it was a really close finish with Neil Mallinson after almost winning the Gowna Festival, coming out on top with 57,83 kg. What a great 2 weeks he’s had! Bob Browne was so close finishing just a few grams behind for 2nd overall with 57,130 kg. 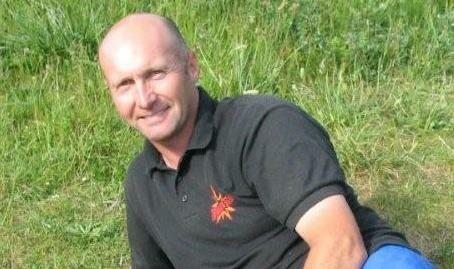 Nigel Franks was also so close to winning, finishing 3rd with 57,060 kg. I was only a few kg behind finishing in 11th place with 50,670 kg. I drew on lower Gullado on the first day. 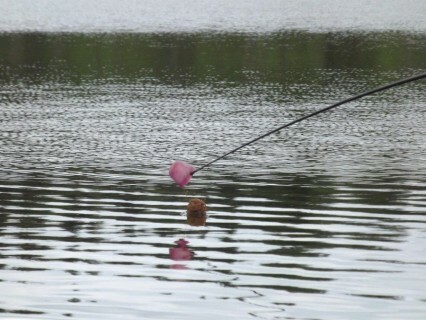 It looked perfect for pole fishing but I had a slow start with only 40 fish in the first two hours. A switch to the feeder was not much better. In the last 3 hours I managed to get the roach feeding and caught them up in the water to finish with 140 for 13 kg; enough to win the section and a good start to the week. Bob Browne won the day from Corfree with 24,790 kg. I drew at Rockfield on day 2. It was a wild day but I managed to fish a pole at 9.5 mts and finished with 150 small roach and perch for 8,860 kg for 4th in the section. 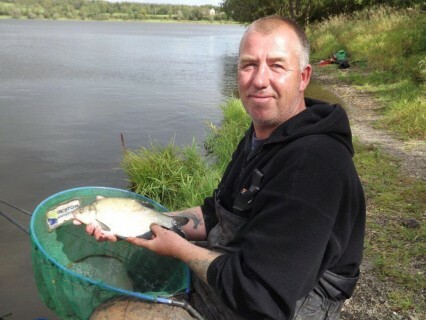 Neil Parkinson won the day from Glasshouse Lake with 19,050 kg. 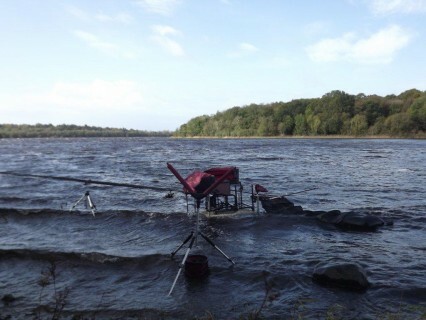 A really strong south westerly wind was blowing on day 3. I had drawn on Rossduff. 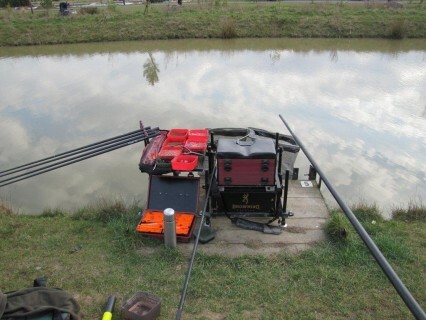 It was impossible to fish the pole, so it was feeder for me, but I had a difficult day and only managed 40 fish for 6.210 kg. 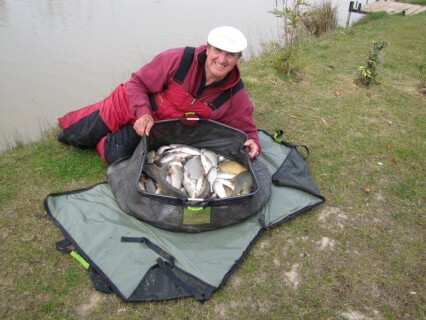 Nigel Franks won the day on Glasshouse with 16 kg. Day 4 saw a change in conditions, it was a beautiful warm calm day. I had drawn at Corfree were weights had been low on this section all week. So I decided to fish pole at 13 mts. 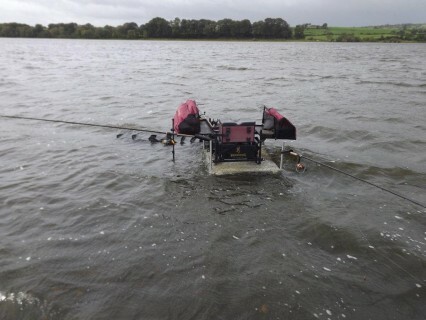 It was really deep, I guess about 4 mts but I had a great day catching roach and hybrids and winning the section with 10,800 kg. 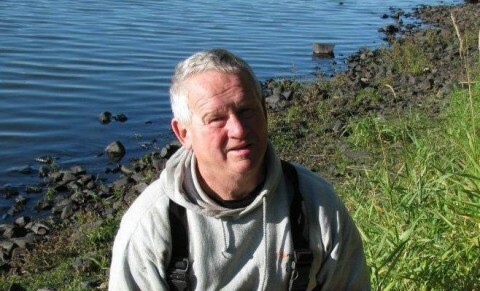 Kevin Johnson won the day on upper Gullado with 17,700 kg. 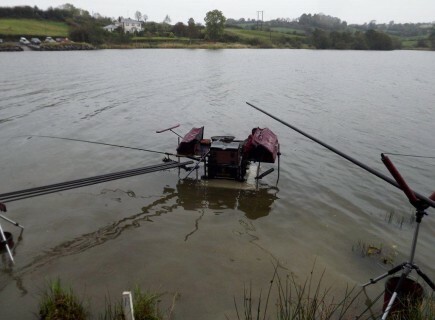 It was a free draw on day 5 and I was back on Rockfield – not really where I wanted to be but I had a good day on the pole at 9.5 mtr loose feeding casters and maggots with a red maggot on the hook. 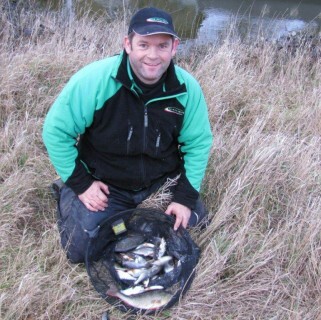 It was a warm day with light winds perfect conditions for pole fishing and I finished with 250 roach, perch and small hybrids for just under 12 kg which was enough to another section win and 4th overall. 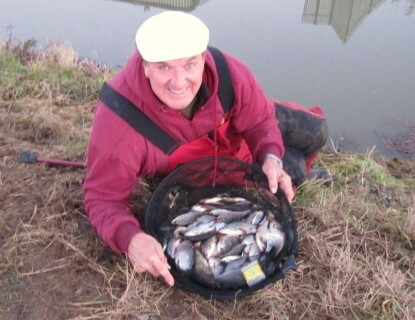 Kevin Rowles won the day from Glasshouse with 14,090 kg. This was a special birthday present from Paul’s partner Carol. Their fishing friend Adrian who also had a fishing day with me at the end of July joined us for the day. 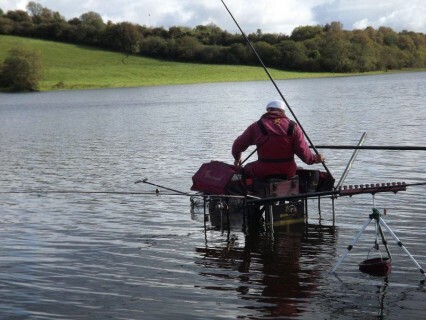 All of them were on a fishing holiday in the South of Ireland. The Town lake at Killashandra was the chosen venue. They were all staying at Lakeside Cottages which overlook the lake. The day began by Carol cooking us all a good Irish breakfast. Feeder was the chosen method. 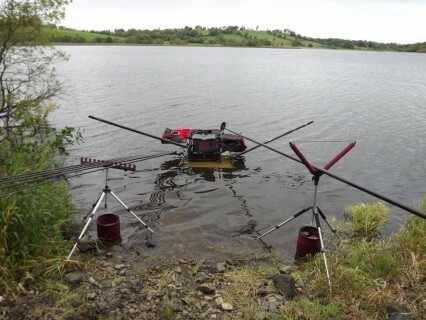 Paul had prebaited 3 swims the previous evening, always a good idea on big Irish lakes and Loughs. 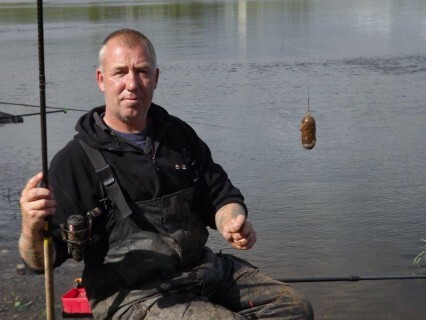 Paul was soon catching skimmers and hybrids casting about 40mts with a 35 gram medium Browning window feeder packed with chopped worms, casters and maggots and the sealed off with Van Den Eynde Gold Pro Bream groundbait with 3 floating maggots on a 14 hook. 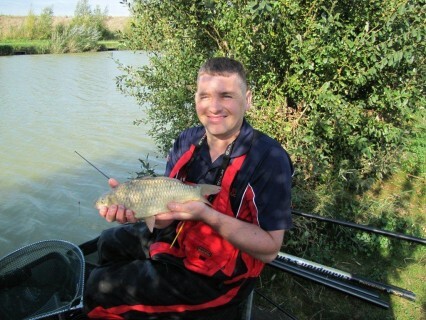 Adrian hooked into a 4lb bream and was catching hybrids and skimmers as well. 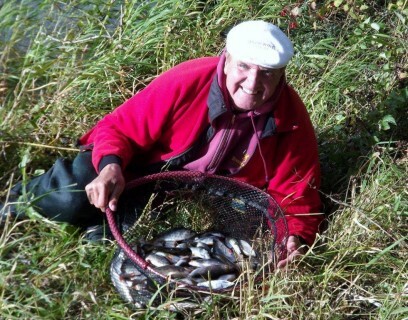 Carol was getting pestered with small perch and then she started to catch roach and hybrids. 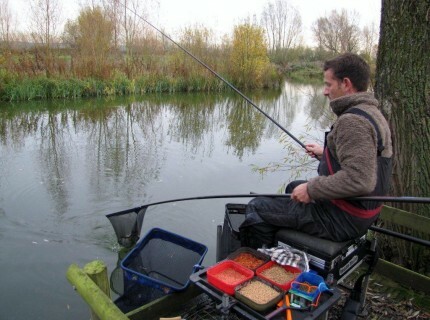 A switch to sweetcorn on the hook in the last hour really switched the hybrids on and Paul was netting fish after fish. I did the catch shot at about 4pm. We weighed Paul’s fish. 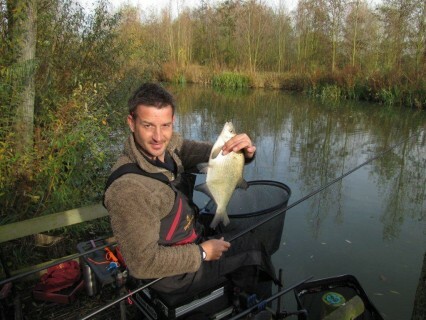 He had caught 17kg, what a fantastic day on the feeder. 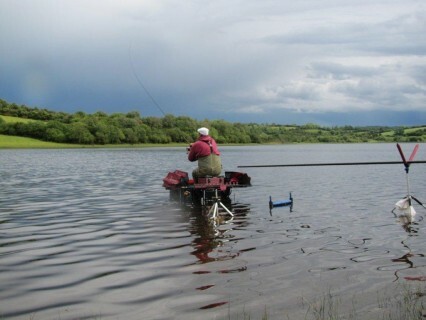 The Gowna Festival is one of the largest in the Irish match calendar, fished in the Lough Gowna area of County Cavan in the South of Ireland. This year 83 angers competed over 5 days on 4 sections on a rotation basis with an open draw on the last day. It was a really close finish this year, grams are always important and so it was proved with John Turton after a brilliant first day performance, coming out on top with 61,980 kg and only 60 grams behind with 61,920 kg was Neil Mallinso. Nicky Seddon was 3rd with 56,440 kg. I managed to get in the main prize list after a big weight on the final day to finish 8th with 45,830 kg. 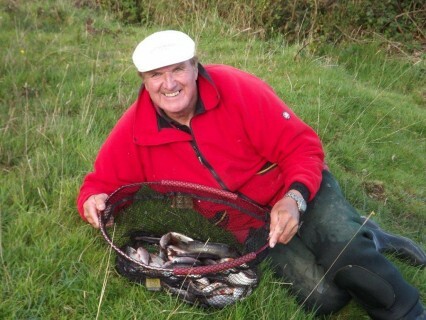 My week started badly only catching 3,800 kg on the feeder at Rossduff. John Turton won the day at Corfree with a fantastic 38,570 kg. Day 2 was not much better. I drew on the good section at Corfree but it did not fish. I only managed 6,660 kg on the feeder. Derek Buckley won the day with 19,620 kg. 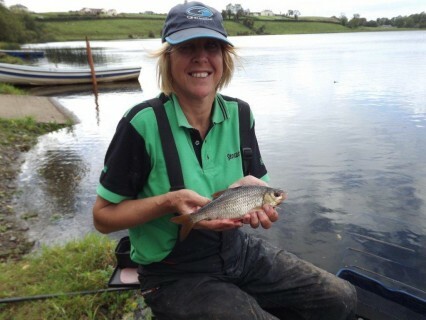 I drew on the Steps section at Gullado on day 3 and had a great day on the pole at 13 mts catching 140 roach and perch for 10,700 kg – just enough to win my section. 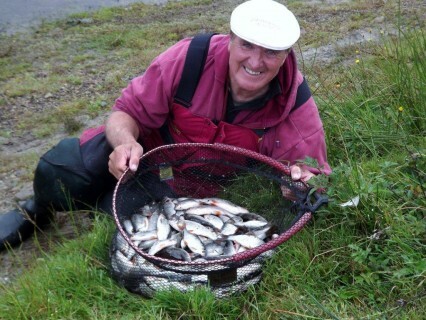 Lee Symonds won the day Kevins Shore on Rossduff with 14,050 kg. 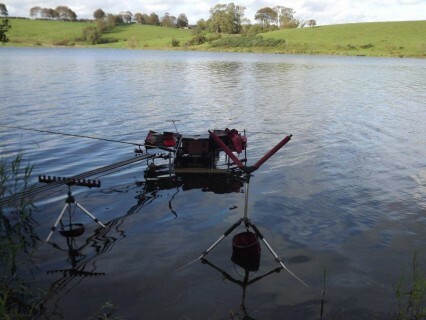 The Leonards farm section had been fishing badly and it did not improve on day 4, but I did manage to win my section on the feeder catching 40 roach and 1 bream for 6,220 kg. 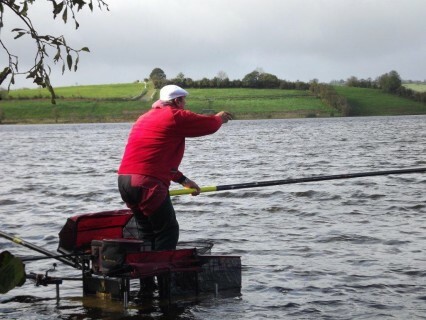 Kevin Johnson won the day from peg 11 on Gullado steps with a brilliant performance, catching 21,640 kg of big hybrids on the pole. It was a free draw on day 5 and I drew a good peg on Rossduff. 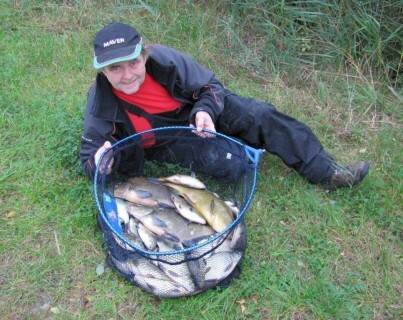 Fishing a 35 gram large window feeder at 30 mts with worm and maggot on the hook and feeding chopped worms, casters and maggots in the feeder, I caught about 80 fish, a mixture of skimmers, hybrids, roach and perch for 18,450 kg which was enough for 2nd overall on the day, which was won by Neil Mallinson with 19,070 kg from peg 21 on upper Gullado. I had a really good start to my Irish holiday festivals winning the first one at Lough Ramor with at total 4 day weight of 49,710 kg. Keith Murphy was only just over 1 kg behind me with 48,010 kg for 2nd overall. 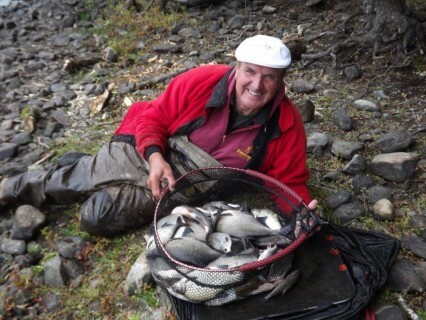 This years Classic winner John Potters was 3rd with 43,510 kg. 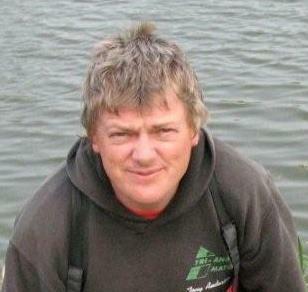 I drew in Brady’s field on the first day and won the section, fishing pole at 13 metres with single maggot and a 16 hook, with a 1 gram float, cupping in Van Den Eynde Superlake and Supermatch groundbait, loose feeding over the top with casters and maggots and caught 128 roach, hybrids and perch for just over 10 kg which was also enough for 3rd overall. Dave Brettell won the day with 14,380 kg. My section rotation saw me on Irvin’s island on day 2. 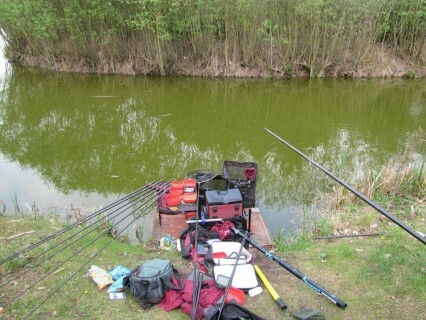 It was perfect conditions with a light wind blowing straight into me. I fished at 13mts again with a 1.5 gram float, loose feeding over the top and throwing a small ball of groundbait every 10 minutes to try to keep the fish down. 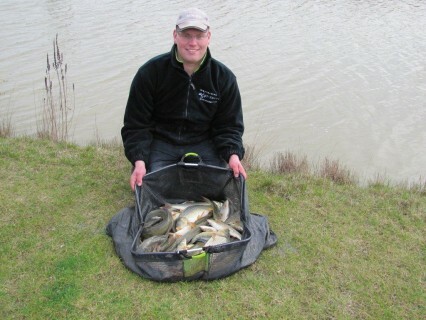 It was fantastic fishing as I was catching almost 40 fish an hour and I finished with 185 fish for just over 16 kg, and 2nd overall on the day. Rory O’Neil won the day with 18,650 kg. Day 3 was tough for me. My section was in Irvine’s field. 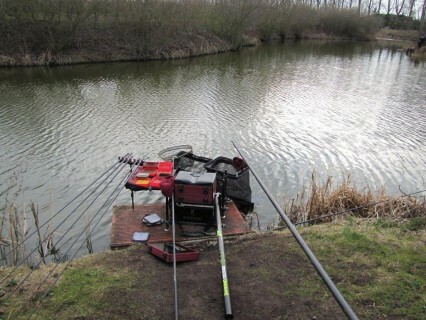 I started on the pole at 13mtrs and was catching on maggot but not that well and after 2 hours my bites had dried up. A switch to the feeder was not any good either, so I went back to the pole. In the last hour a switch to caster on hook resulted in some big net roach between 200 and 300grams and I ended up winning the section with 10,500 kg. 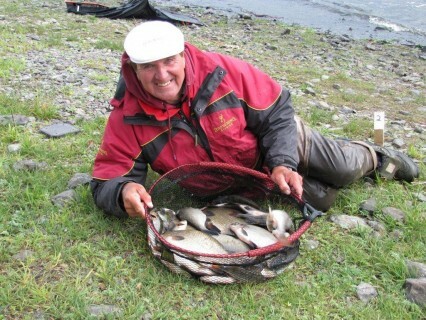 John Potters won the day with 15,250 kg. On the last day it was my turn to fish the match length. 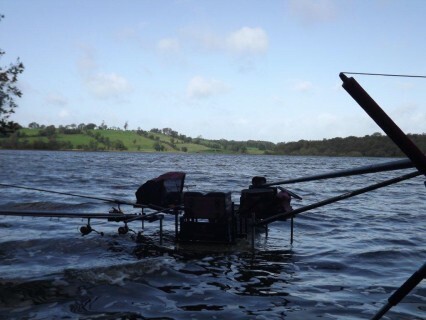 The wind was strong from the Northwest making pole fishing difficult, but I managed to fish at 13mts cupping in loose groundbait and loose feeding over the top with maggots and casters with a single red maggot on the hook. 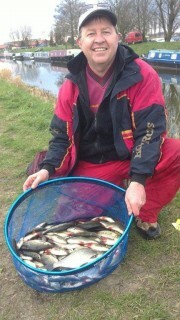 I caught 130 roach for 13,100 kg which was enough for 1st overall on the day. 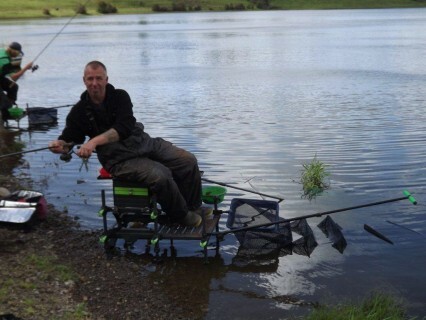 Brian Clay finished on top, his big weight of 20 kg on Wednesday helping him towards a 5 day total of 52,580 kg. Kevin Johnson had consistent performances all week to finish second with 49,500 kg. Pete Jones was 3rd with 45,870 kg. 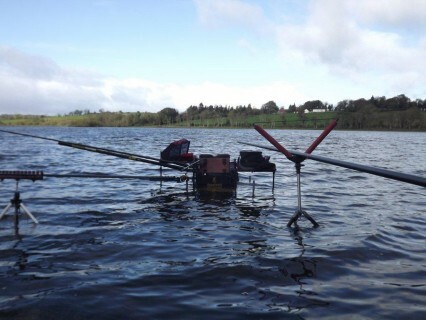 The Arvagh Seniors Classic is held on Lough Gowna in County Cavan Southern Ireland 75 anglers taking part on 5 sections over 5 days. 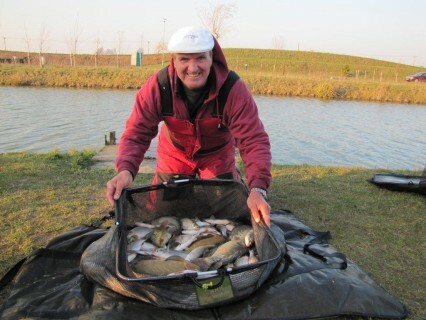 I had a tough week only once catching more than 10 kg, but still managed to win 4 of my 5 small section prizes. 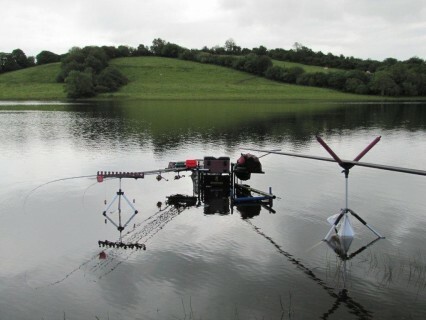 On day 1 I drew at Rockfield and fished a combination of pole and feeder for just under 6 kg. 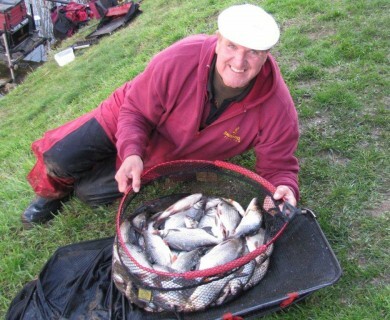 Nicky Harrison won the day from Nigel’s Shore at Corfree with 17,500 kg. 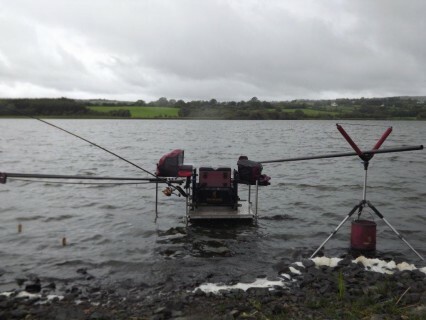 Day 2 I was on upper Gulladoo and fished the feeder at 30 mtrs for 4,400 kg. Francis McGoldrick won the day from Nigel’s Shore with 14,580 kg. My best day of the week was day 3. 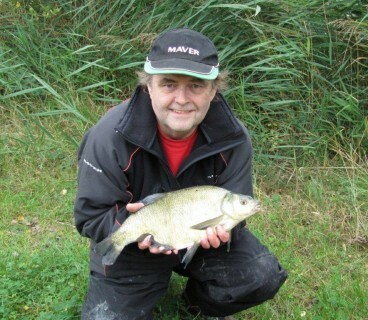 I drew peg 2 on Kevin’s Shore and had a great day on the feeder at 30 mts catching 2 big bream, some skimmers and perch for 11,650 kg. Brian Clay won the day from C5 at Corfree. Day 4 was my toughest day of the week. I drew peg 2 at Corfree and only managed just over 3 kg. 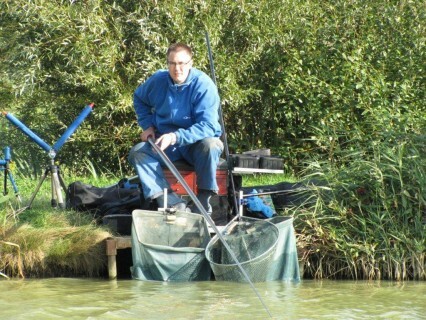 I still won my small section though, Neil Buist won the day from the end peg 15 at Kevin’s Shore. 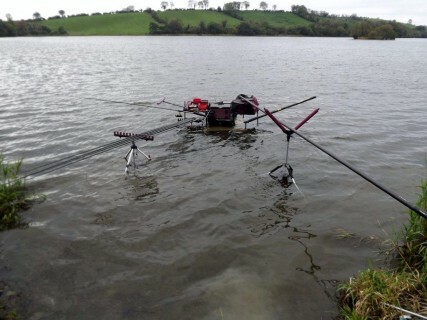 Peg 3 on Nigel’s Shore was my last days draw. I fished a window feeder at 40 mts with double maggot on the hook for just under 6 kg. Kevin Johnson won the day with just over 13 kg. I finished 22nd overall with a total of 33,930 kg. 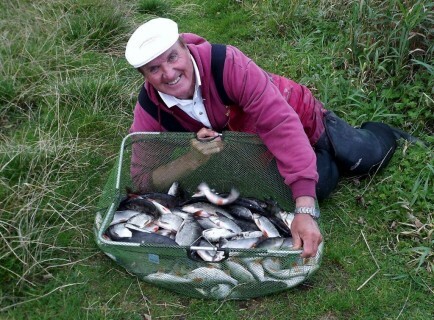 A tough week but there was still fish to be caught every day. 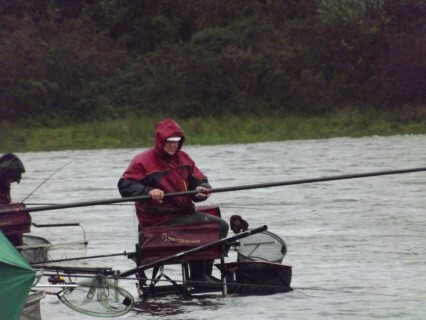 A dramatic last day saw only 290 grams separating the top 2 anglers with John Potters (Lisbellaw) coming out just in front of Kevin Ashurst (Irvinestown). 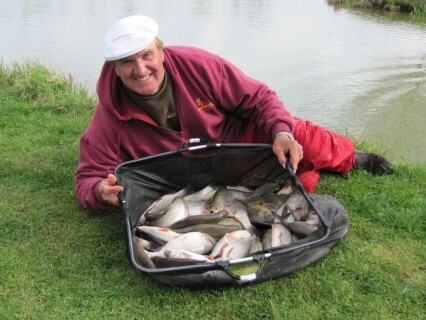 John’s winning total weight for the week was 46,120 kg as he put in a brilliant 3 day performance to win the £5000 1st prize and to deny Kevin the chance of becoming the only angler to win the Classic twice. 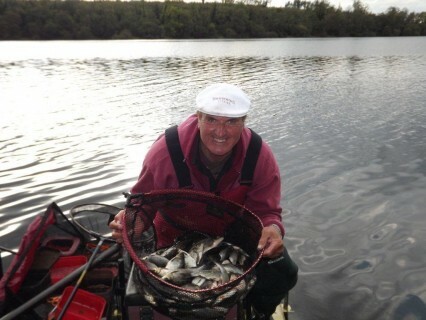 Kevin had a fantastic last 2 days, recovering from a 1st day of less than 3 kg to come so close to winning the big prize. His total for the week was 45,830 kg for 2nd overall and a cheque for £2000. 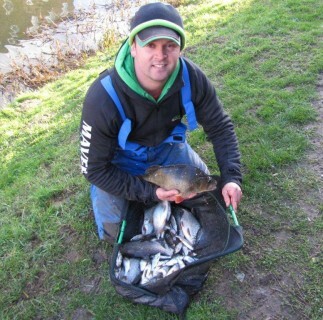 Andy Leathers (St Neots) continued where he left off after winning the Mahons festival last week to finish 3rd overall with 35,610 kg. He has had a great 2 weeks and will need to hire a security firm to help him take his winnings home!!! 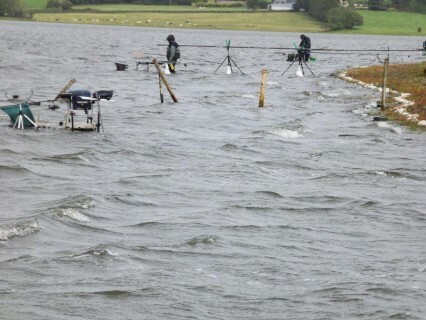 On day 1 I drew in the Queen Elizabeth road section and fished long pole cupping in sloppy groundbait and loose feeding a few casters for a section winning weight of 3.750 kg. 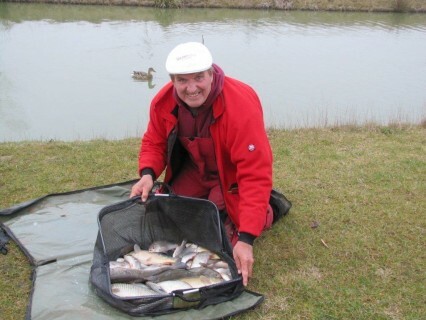 Michael Wright won the day from peg M9 at the Manor House with 27,760 kg. Day 2 saw me on another tough peg Cornagrade 1. 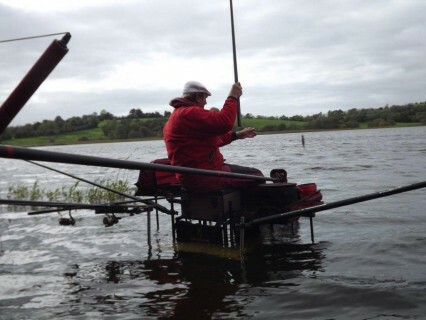 I fished long pole again cupping in sloppy groundbait and fishing just off bottom with a single pinkie on the hook for 80 roach and a section winning total of 3,260 kg. 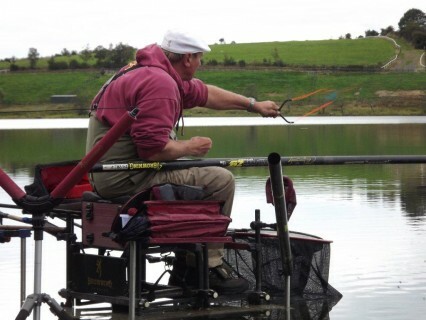 Kevin Ashurst won the day from peg E14 with 24,480 kg. Kevin, Barry Smith and myself have been sharing our winnings for about the last 20 years. Thanks Kevin for a great share-out this week. The last day saw me back on Cornagrade again this time peg 14. 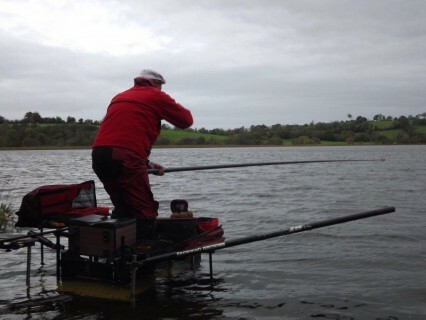 After the 1st hour on the feeder I switched to long pole, cupping in groundbait, loose feeding with casters and fishing about 6 inches off bottom in 16 feet of water with single caster on the hook. 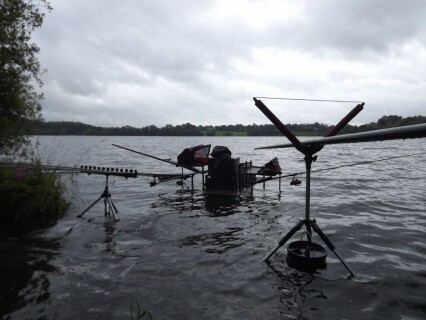 It was my best day of the week catching big hybrids for 7,280 kg and another section win. 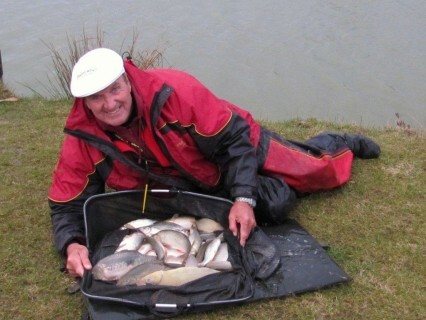 Phil Roxburgh won the day from Boa island 1 with 21,860 kg. The 4 man team event run in conjunction with the Classic is always very competitive and this year was no different with my team (Van Den Eynde) coming out on top with a 3 day total of 84,570 kg – only just a few grams in front of the runners up (All The Gear No Idea). 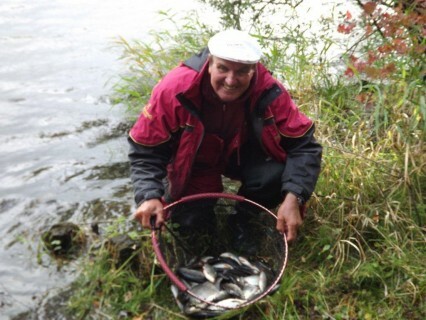 The Classic is by far the largest Festival in the Irish and European calendar, fished around the Enniskillen area of County Fermanagh in Northern Ireland. 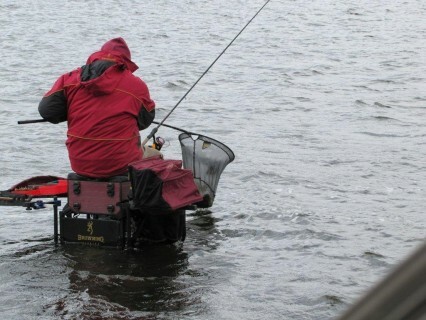 With 250 anglers competing and so many different sections the draw is always vital. 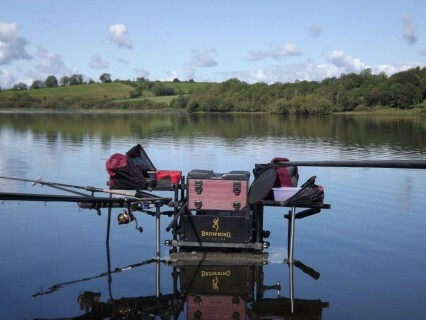 With low water levels it was always going to be a tough 3 days and so it proved for most of the competitors, but I am sure most will be back next year for a chance to become ‘Classic’ winner 2012. 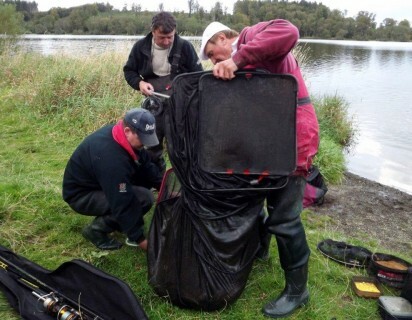 Mahons is the first big Irish festival of the year, fished over 5 days on different zones around the Enniskillen area of Northern Ireland. 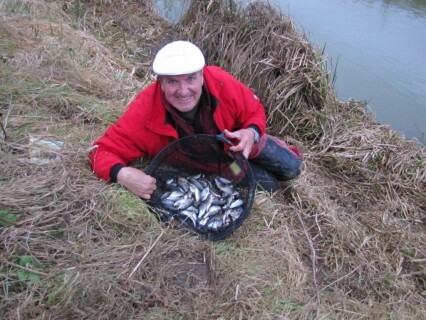 The cold east winds, bright sunshine and no rain for 3 weeks kept the weights well below normal, but as always there are some pegs that produce good fishing. 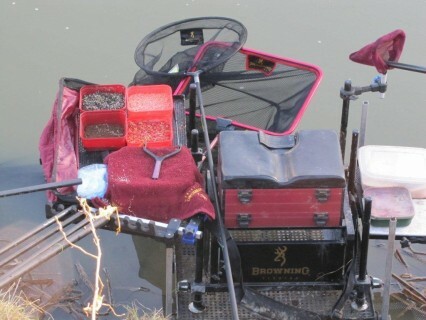 Andy Leathers (Browning Hotrods) produced a brilliant consistent performance over the week, winning his section on 4 days to finish almost 10 kg in front with 67,800 kg for first overall and a £2000 prize win. Chris Stevens finished 2nd overall with 58,540 kg which even included a blank on day 2. 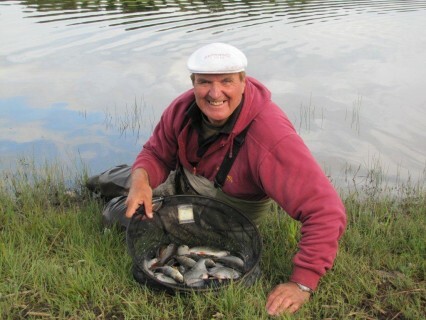 Ray Baker recorded the biggest catch of the week 40,650 kg from peg 1 on the castle wall to help into 3rd place overall with a total of 54,780 kg. I had a good festival finishing 7th in the main prize list. 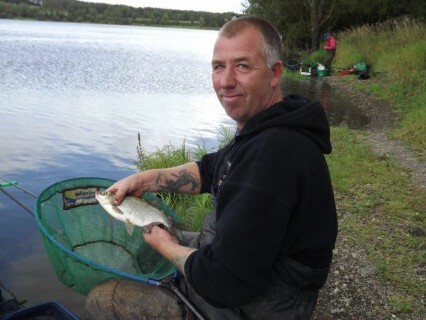 On day1 I drew at Loch McNene and fished with a 40 gram window feeder at 50 mts catching 7 bream and a few small fish for a section winning total of just over 7 kg. Winner on the day was Tony Kersley with 21,860 kg. Day 2 was my best day. I drew a section on lower Loch Erne called Lockies Bay. It was a really rough day with a strong facing wind and so I decided to fish with a 50 gram large Browning window feeder at 40mts. 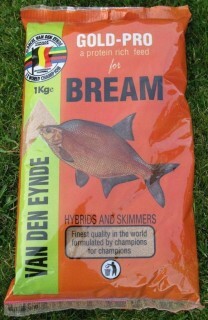 Groundbait was 50% Van Den Eynde Gold Pro Bream and 50% brown crumb; with choppped worm and casters in the feeder. It was a slow start; just catching the odd large hybrid but in the last 90 minutes my swim exploded as big bream and hybrids came to the net. I guess I must have caught almost 20 kg in that spell for a weight of 26.170 kg and 3rd overall on the day. Ray Baker won the day from the castle wall with 40,680 kg. Ross loch was my day 3 draw. 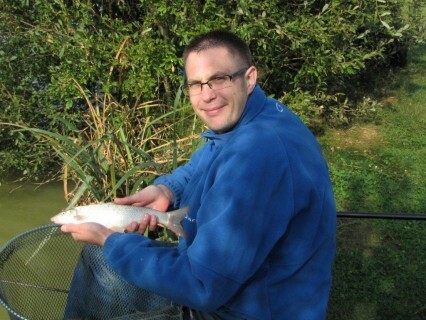 It’s really shallow, less than 2ft deep but has a good head of small fish. 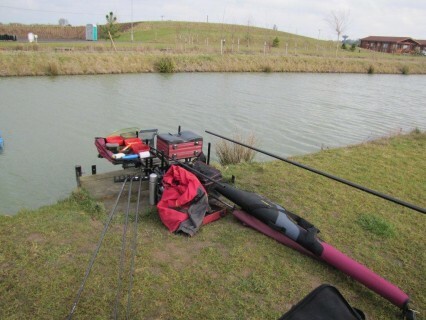 I fished a combination of long pole and feeder for 6,520 kg – enough to keep me 4th overall on the week. The castle wall won the day again with K. Simpson catching 23,620 kg. Day 4 was a really bad draw for me. I drew number 8 on the Airport. Not a fish had been caught on this section all week. 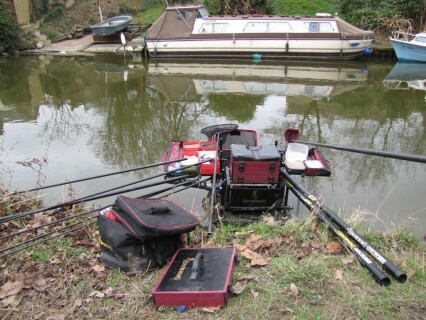 I still was not disillusioned and went to my peg determined to catch. I did manage to catch 1 150 g roach and even missed 2 bites as well, for another section win. 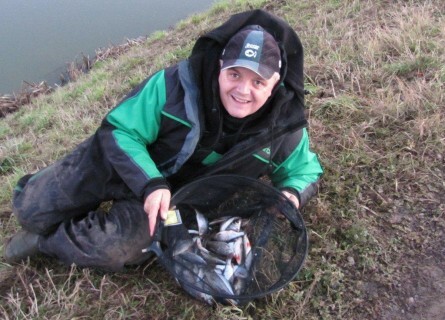 Peg 1 on the castle wall has been the place to be this week with Mark Godfrey winning the day with 38,400 kg. 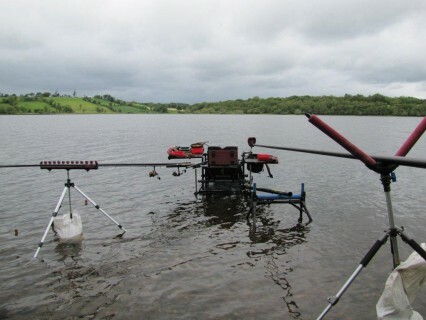 I drew peg 20 at Derrycharra and fished the feeder at 35 mts. I really wanted to fish the pole but the wind was too strong, it did drop in that 10 minutes of the match and I caught 6 roach. 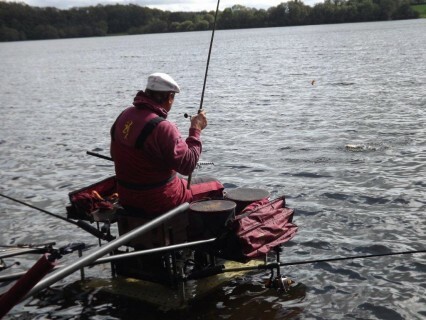 But most of my fish were caught on the feeder for a section winning 4,050 kg. 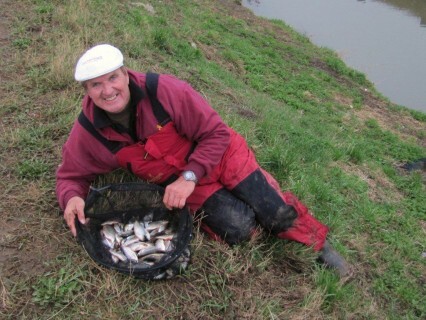 K. Wynne won the day from peg 1 on the castle wall with 26,700 kg with a catch that included 40 eels. 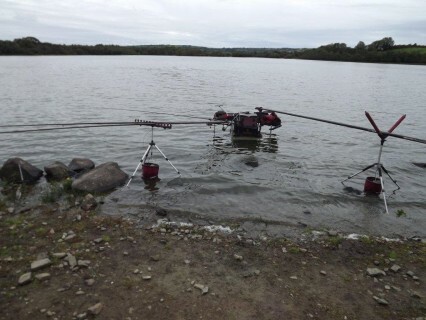 This was a fantastic final with good weights coming from all round the lake on both days. More than 100lbs was needed to get into the top 10. 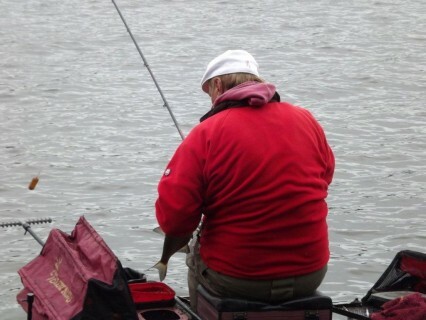 Simon Wheeler (Daiwa Dynamite) showed his class by winning on day 1 with 88lbs 2ozs and then coming 8th on day 2 with 57lbs 12ozs for a winning total of 145lbs 14ozs. 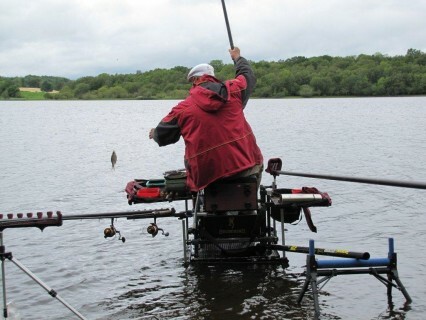 Richard Bond also had a great weekend coming 2nd on Saturday with 79lbs 3ozs and adding more than 50lbs on Sunday for a total of 132lbs 13ozs and 2nd overall. Stuart Bracey (Dynamite Baits) is hardly ever out of the money here and showed his class coming 3rd overall with 129lbs 5ozs. 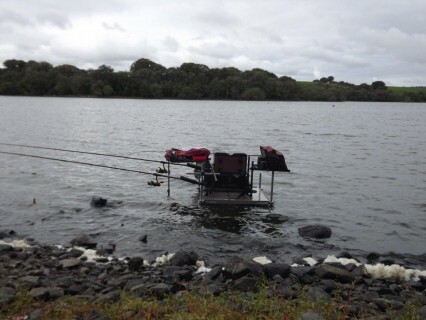 I drew peg 60 on the first day and had a good match fishing long pole (17,5 mts) to the island with 4mm expander pellets for just over 42lbs missing out on my section by 3ozs. 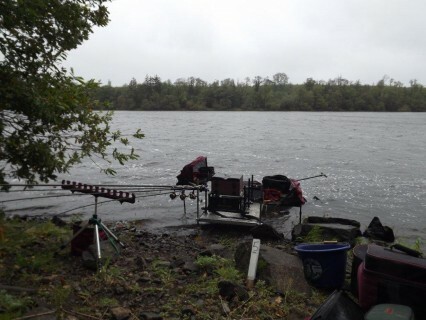 On day 2 I was on peg 8 and caught just over 34lbs fishing catmeat in the margins on my left and pellet against the island, for a weekend total of about 77lbs. This was the last match before the big weekend final. 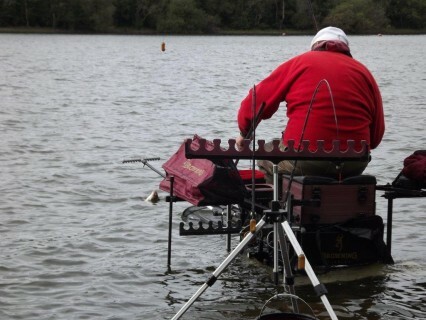 Ray King (Lewis A/W) finished way out in front from peg 47 with 85lbs 8ozs. 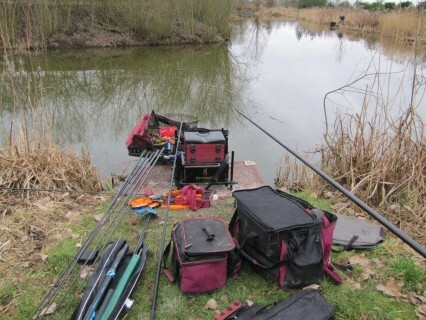 Ray fished long pole and 6mm expander pellet for 51lbs of skimmers and brown goldfish plus 34lbs of F1’s and carp. 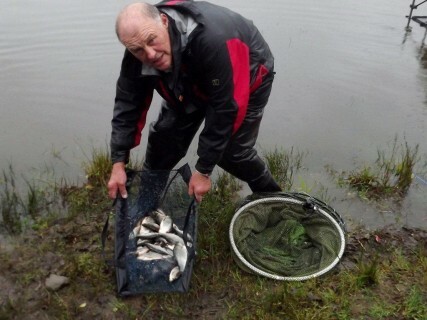 2nd overall from peg 21 was Richard Bond with 62lbs 2ozs. 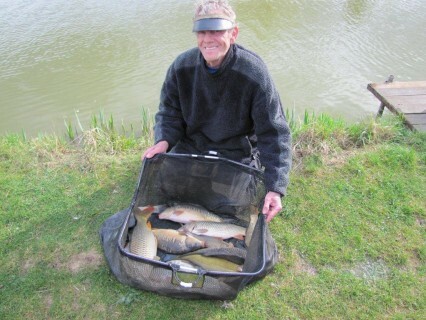 In 3rd place was Richard Martin with 54lbs 12ozs. 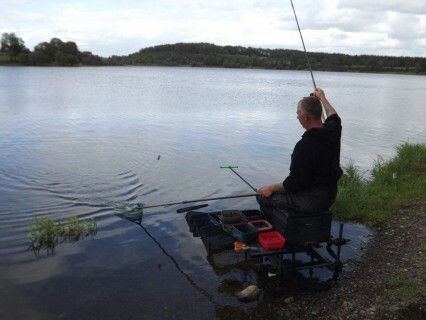 I drew peg 8 and fished tight to the island at 13mts with pellet, just using a small pot on the pole with 2mm Van Den Eynde hard feed carp pellets and a 4mm expander on the hook for a mixed catch of skimmers, brown goldfish and F1’s for just over 43lbs. 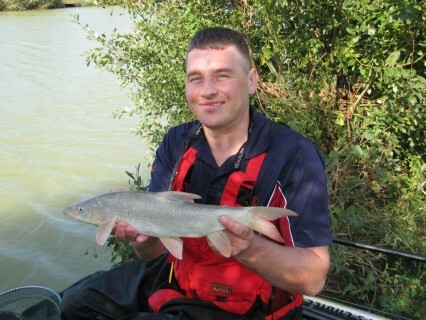 Some of the big barbel put in an appearance in the latest Westwood Open on Kestrel Lake. 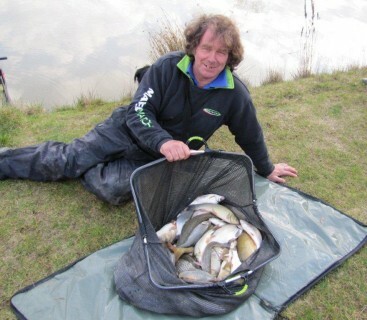 John Spalton (Maver bait Tech) had one of over 6lbs plus some big chub and ide for a winning total of 69lbs 10ozs. 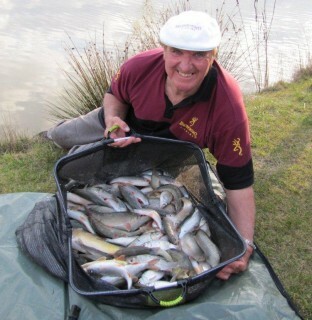 John loose fed casters at 14.5 mts and fished single caster on the hook for a brilliant all silver fish catch. Ted Burks ran him a close second fishing long pole and pellet against the island for 68lbs 6ozs. 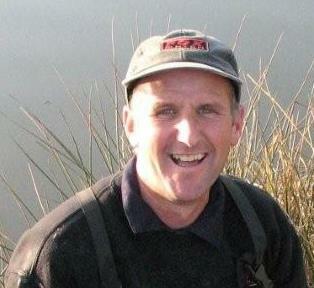 Dave Thornton also included 2 good barbel in his 3rd placed catch of 58lbs 2ozs. 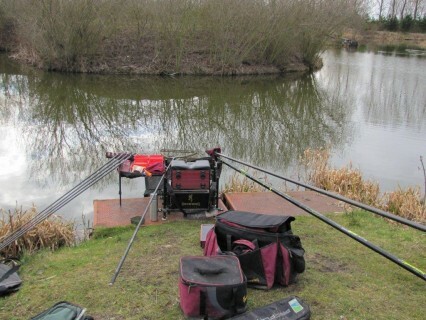 I drew peg 5 and fished long pole with mainly single white maggot on the hook, loose feeding and using a small pot on the pole for 49 big ide and 2 small carp. It was difficult to get bites but enjoyable as the fish were a good size. 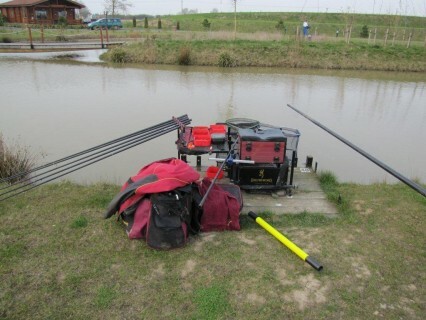 With warm calm conditions Skylark fished really well with most anglers catching over 20lbs. 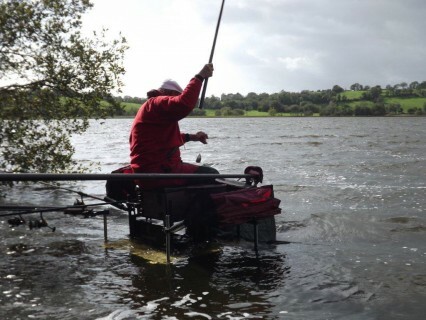 It was tight at the top with Steve Daves coming out in front from peg 4 with 59lbs 12ozs. I was about 2lbs behind with 57lbs 14ozs and had a great match fishing long pole to the island with maggots in about 12inches of water. 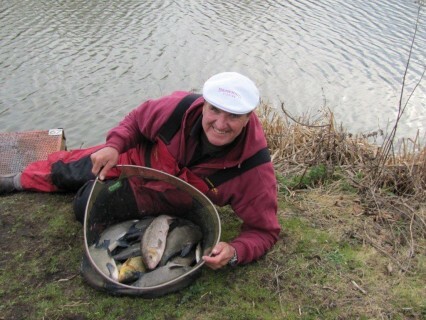 I was loose feeding maggots in one swim in front of me and cupping in with a small pot in another swim on the corner of the island for a mixed net of carp, ide and tench. 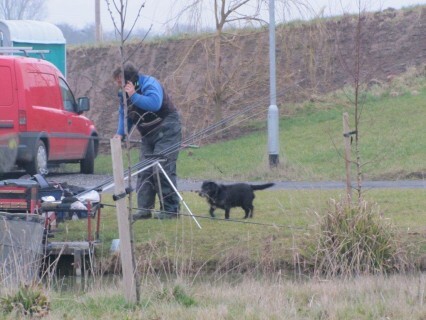 My travelling partner John Spalton has trained his dog Jack to empty the net as it’s lifted from the water. 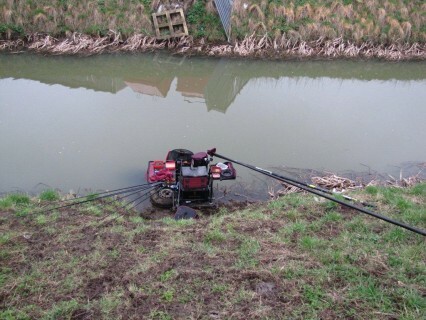 Well it’s a novel way of trying to win, particularly when you have drawn the golden peg!!! 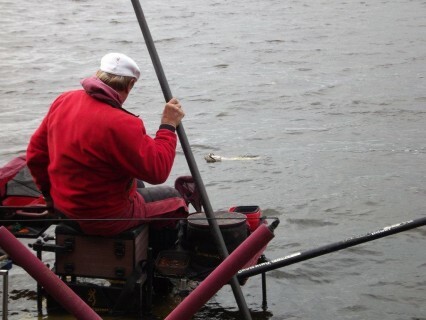 Steve Lane fished long pole and paste tight to the island for 54lbs 13ozs and 3rd overall. 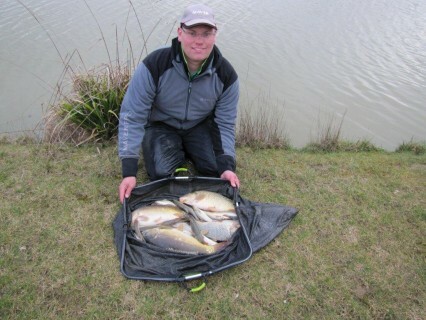 Another great attendance in the Sunday open: peg 1 on Skylark lake has been the form area at the moment and Ben Brighton (Garbolino Lincs County) made no mistakes with 53lbs 8ozs of small carp on pole and pellet. 2nd overall with 40lbs was Sean Higginbottom. 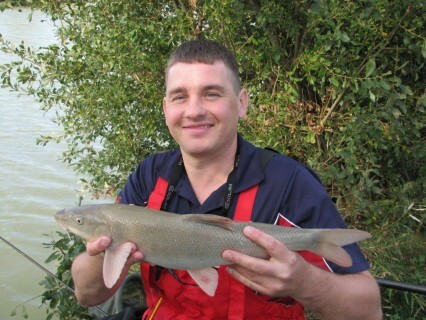 Sean fished at 4 metres with worm and maggots for a terrific net of small barbel. Steve Winters was 3rd with 34lbs 12ozs. 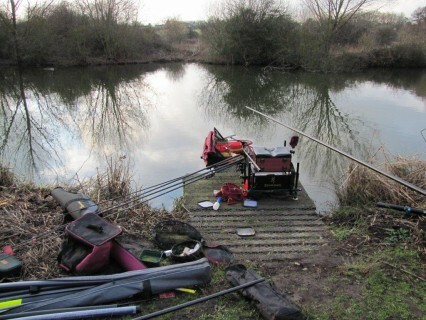 I drew peg 3 which is a good area, but with almost every peg taken and a cold morning it was quite difficult. 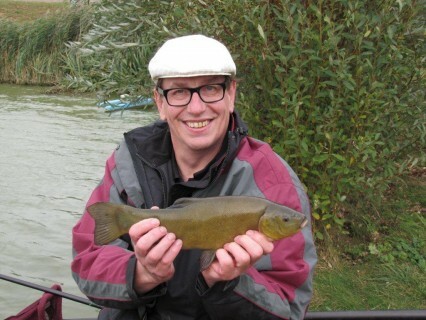 My only bonus fish was a 2lb tench. Even fishing for the ide was a struggle but I still managed to catch about 80 fish for just over 24lbs enough to win my section by default. 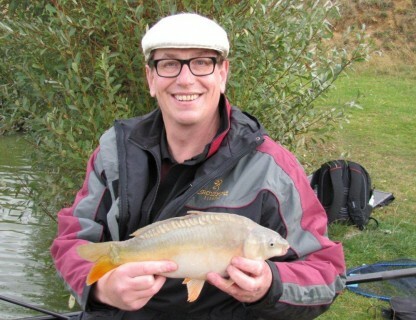 At last some warmer weather, after a long hard winter it was great to just fish in a shirt and jeans. 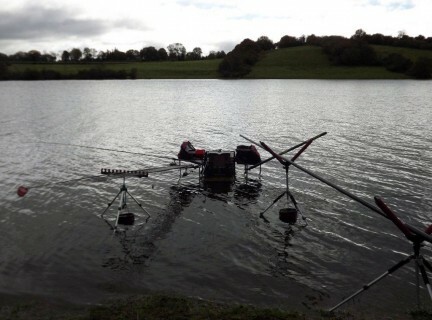 The venue fished well and apart from Gary Burton who drew peg 1 and finished way out in front with 66lbs 2ozs. It was farly close after that. 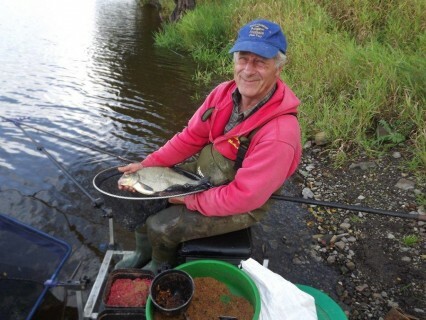 Alistair Oglivie was 2nd with 43lbs 8ozs and my travelling companion John Spalton was third with 43lbs 4ozs. I was 5th with 41lbs 4ozs. 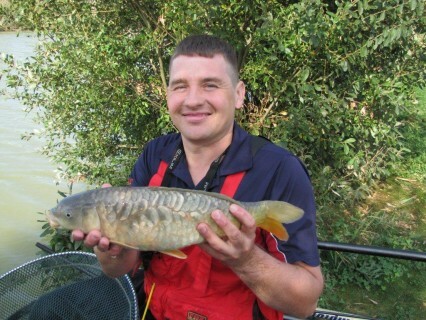 After starting at 11 metres with pellet I had caught 3 small carp in the first 30 minutes. 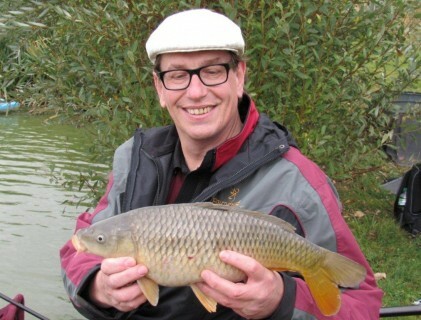 A switch to maggot on the far bank seemed much better. 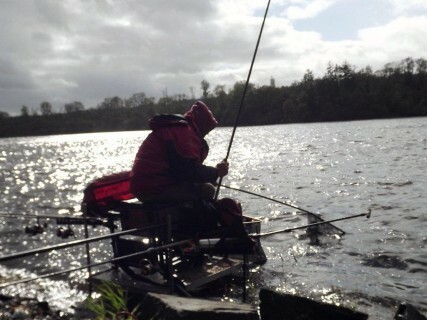 Loose feeding and fishing for the ide was going well up to the last hour. 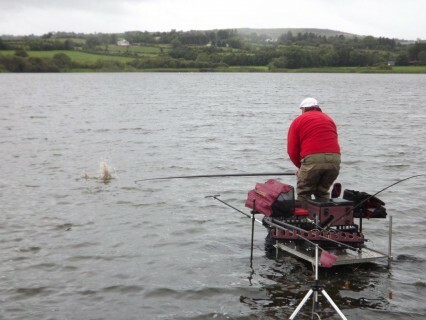 Then my swim died, leaving me without a chance to get in the main frame. 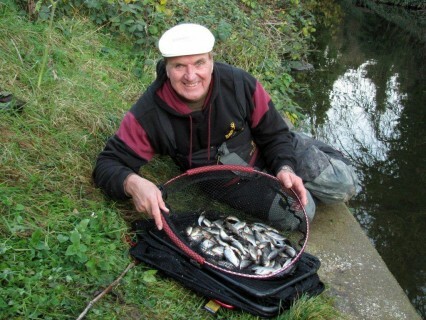 This was the first round in series of 5 matches fished throughout the official close season. 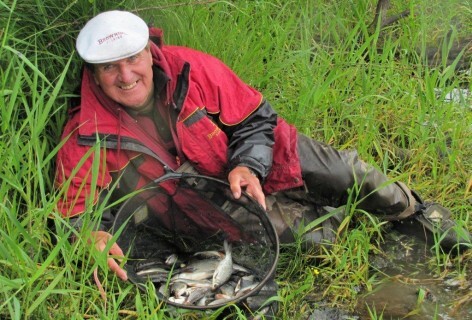 I am not able to fish all of them, so I was a guest for Wakelins Warriors. 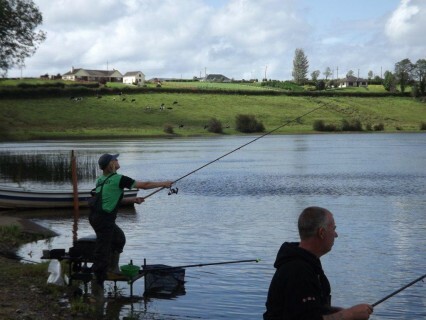 17 teams were competing, team matches always seem to attract a larger number of anglers and even if you are on a bad peg there is always something to fish for. Gavin Butler (Maver Bait Tech) drew peg 1 next to the bridge on Hawk lake and had a fantastic day winning the match quite easily with 96lbs 12ozs. 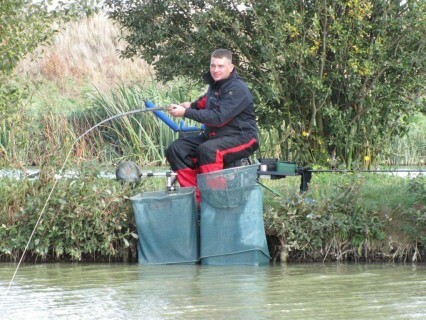 Rick Tweddell was on peg 20 (the other side of the bridge) and also had a great weight 69lbs 4ozs for 2nd overall. Ben Brighton was 3rd from Skylark lake with 56lbs 12ozs. 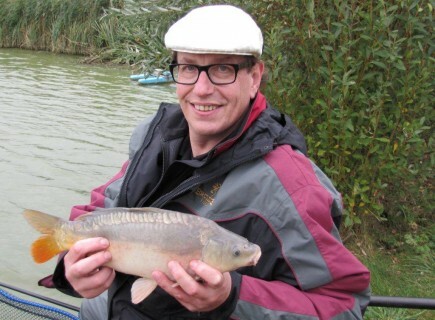 I drew peg 6 on Skylark and was happy enough, but it was tough going and I caught mainly ide and just a couple of carp, loose feeding maggots on the far bank and fishing in about 18 inches of water with single white maggot on the hook. Still I managed to win my section by default, also my team tied for first place with Maver Bait Tech. 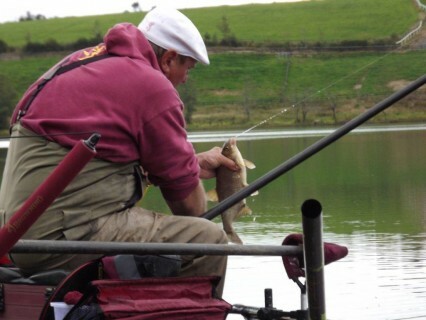 Cross Drove is still fishing well with good weights coming from all around the venue. 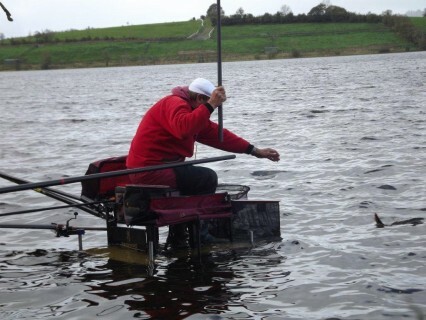 Ray King (Lewis A.W) drew peg 21 and fished pole and pellet for a winning weight of 62lbs 1ozs. 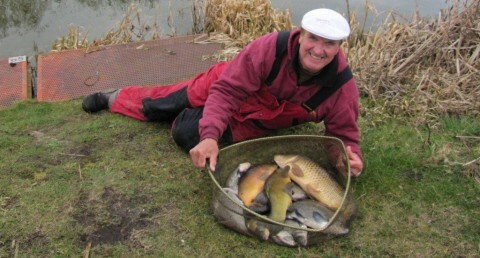 Jim Barrowman fished in the margins from peg 65 with bread and pellets, and caught carp to 10lbs plus big F1’s for 57lbs 2ozs and 2nd overall. 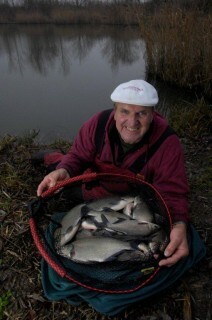 Mark Pollard was third with53lbs 15ozs. 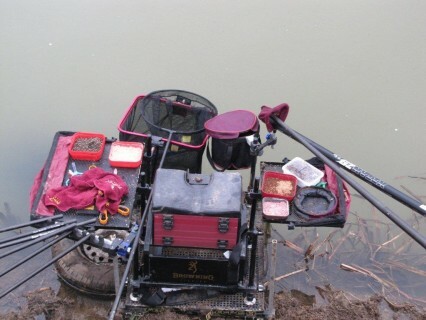 I drew peg 2 and fished at 16 metres with pellets and maggots for just over 30lbs of F1’s and brown goldfish. 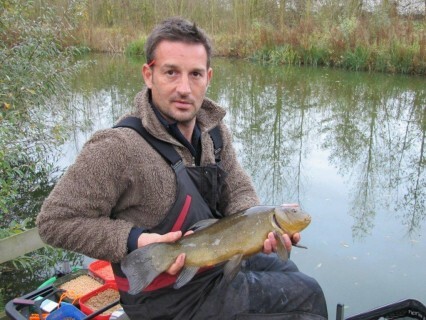 The bypass section of the river was the area to draw, as the big rudd turned up in numbers. Way out in front with his second consecutive open win here was Stuart Northrop (Browning Hotrods). 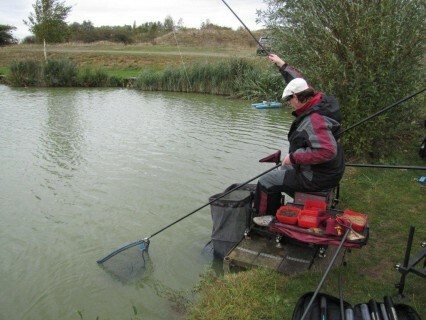 Stuart drew the end peg and fished long pole for a brilliant weight of 34lbs 7ozs which included several rudd over a pound. 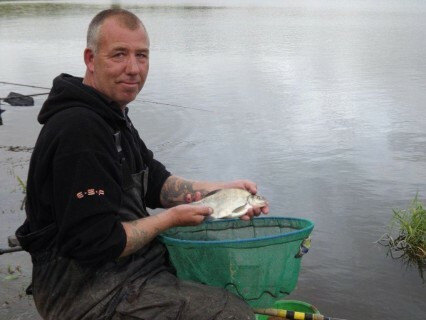 Just a few pegs away local angler Tony McGregor also had an all rudd catch of 23lb 5ozs. 3rd overall from the same section, with 21lbs 10ozs of rudd and skimmers on the waggler was Lindsay Naylor (Browning Hotrods). 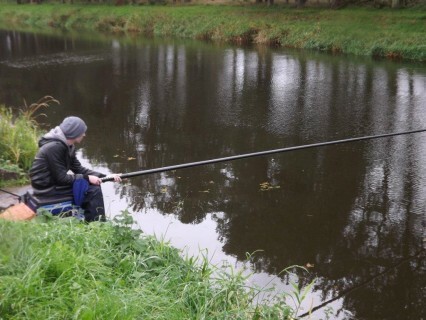 I drew a few pegs below the Health Centre bridge and fished punch in the deep water, catching some skimmers and rudd early. 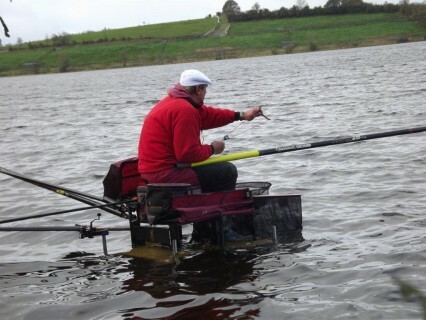 Then I had to switch to loose feeding pinkies over against a boat. After my swim died a switch to punch again in the last hour resulted in a few more fish and I ended up winning the section with 15lbs 1ozs. 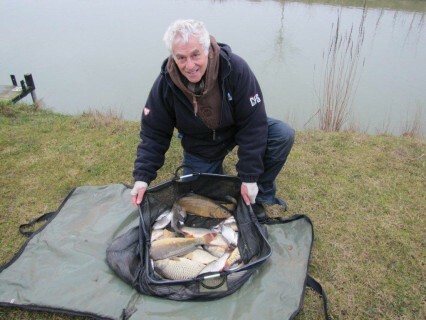 Peg 1 is the form area at the moment and Tony Anderson (D.A.D.Suffolk) made no mistakes fishing straight lead with punched bread for a winning weight of 79lbs 12ozs. 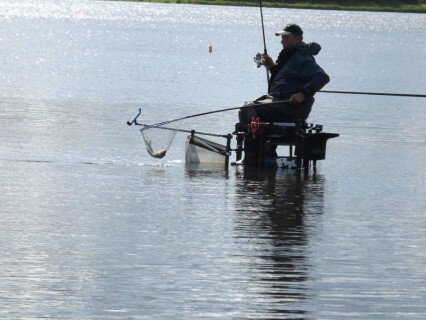 Vince Cross had a busy day on peg 21 catching small F1’s and brown goldfish on long pole for 57lbs 4ozs and 2nd overall. 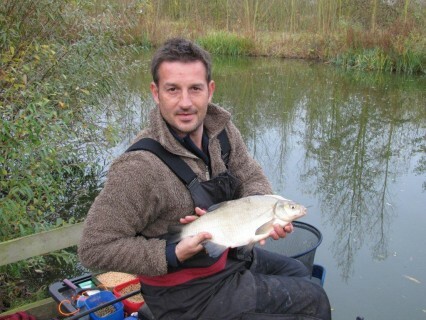 Paul Goldstraw was 3rd with 43lbs 20zs. 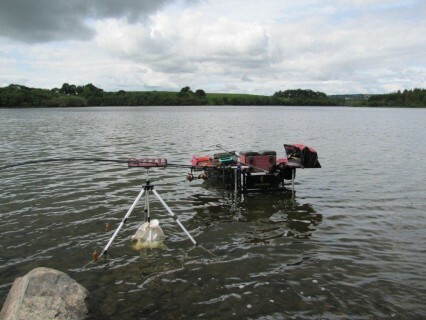 I drew peg 67 and did not get any bites in the first 2 hours, then started to get some signs that fish were starting to feed. 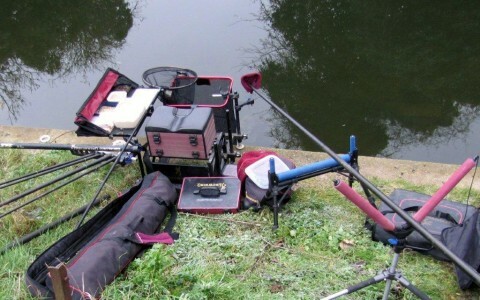 I finished with only 11 fish, 9 bream, 1 small carp and a chub for just over 23lbs. 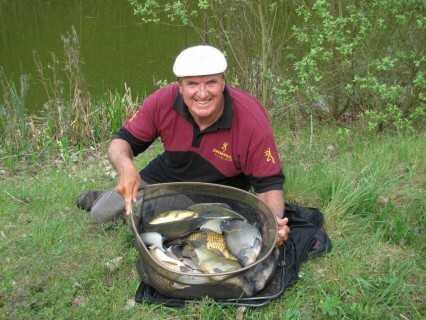 Mark Pollard (Fox Dynamite) showed his class again, winning the latest midweek open with 78lbs 9ozs. 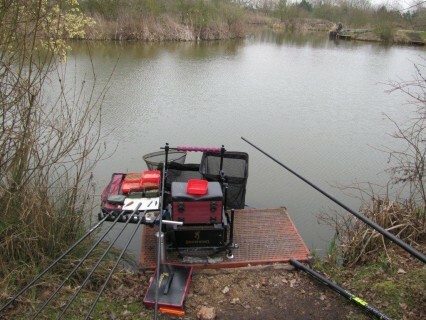 Mark drew peg 41 and fished pole with meat and corn catching carp to 14lbs and F1’s to 5lbs. 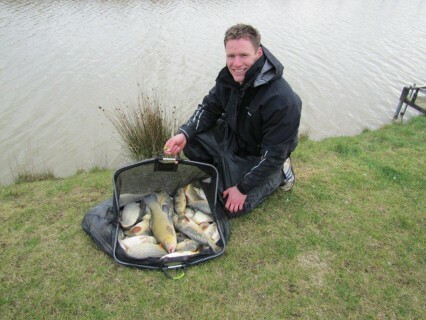 Local angler Ian Shipp was second from peg 50 with 58lbs 4ozs. Jim Barrowman was only just a few ounces behind with 58lbs 6ozs for 3rd overall. 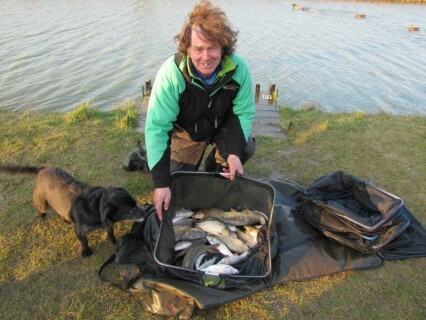 I drew peg 65 and managed to win my section with 2 good carp, a tench and some bream for just over 30lbs. 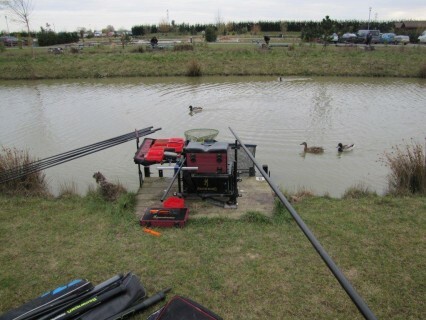 There was a good turnout for the latest Westwood Lakes Open and despite a hard frost it still fished remarkably well. 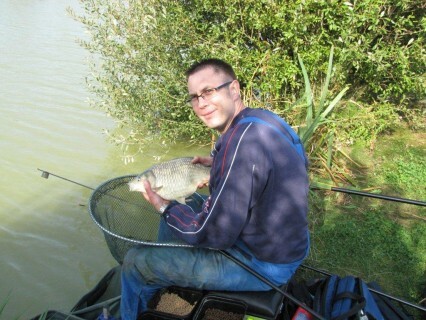 Alex Bates (Sensas mk 1) finished well out in front with a brilliant 52lb catch of mainly small carp. 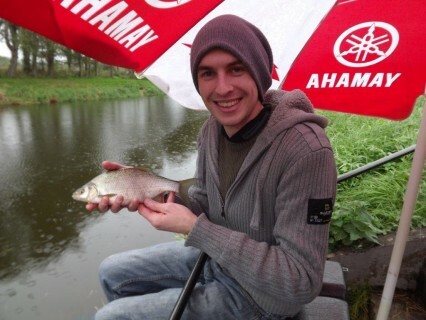 Alex fished long pole against the far bank with pellets feeding with 2mm carp pellets with a 4mm expander on the hook. 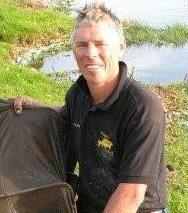 I was at the next peg and used a different approach loose feeding maggots close to the far bank and catching ide on single maggot. I was catching well, but a switch to fishing in the deep water just off the shelf in the last 2 hours was much better, the fish were bigger and coming just as quick. 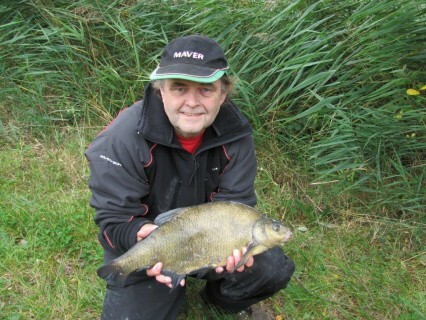 My catch even included a beautiful 5lb tench. At the weigh in I had 45lbs 4ozs just enough for 2nd place. 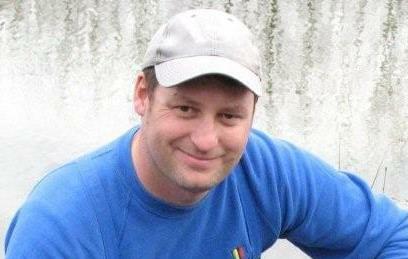 Adam Wakelin (Preston Innovations) ran me very close. 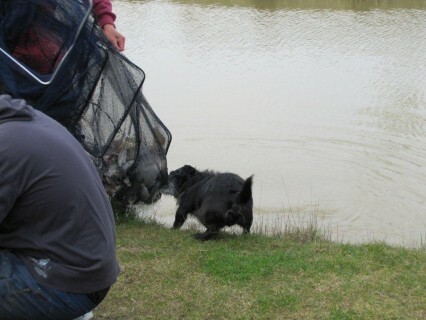 He finished with 45lbs for 3rd overall. 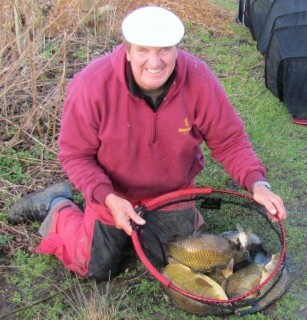 Stuart Bracey drew the Golden peg 52 and showed his class winning the day with 50lbs 4ozs. 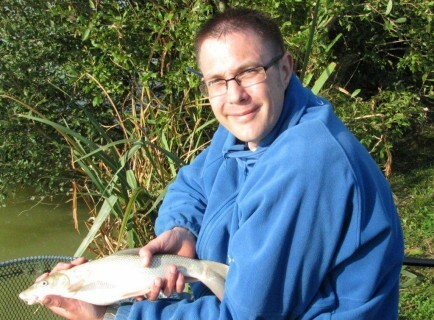 Stuart fished long pole and pellet also alternating with sweetcorn catching F1’s, skimmers and brown goldfish, collecting over £600 on the day. 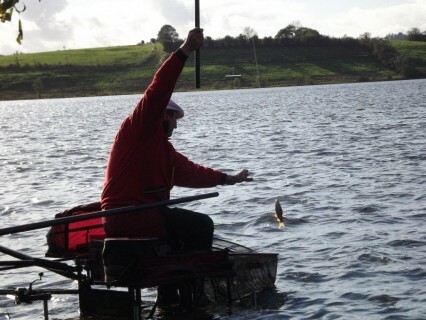 Noel Rock ran him fairly close from peg 70 with 47lbs of big F1’s for second overall. Mark Pollard is hardly ever out the money here and today was no different as he finished 3rd with 45lbs 12ozs. 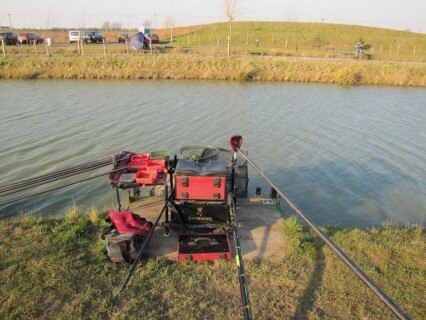 I drew peg 58 and really lost too many fish in the rushes, but still enjoyed the day finishing with just over 19lbs. 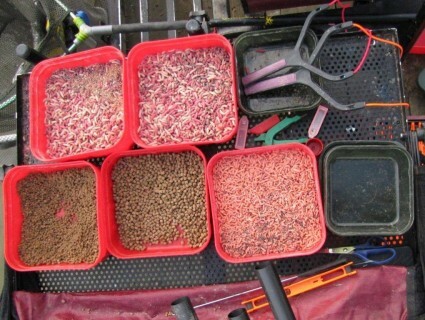 I have just started a new series in Total Coarse Fishing read all about my pellet approach for catching big skimmers in the April issue on sale now. It’s not very often that you get a dream peg, but today I did. 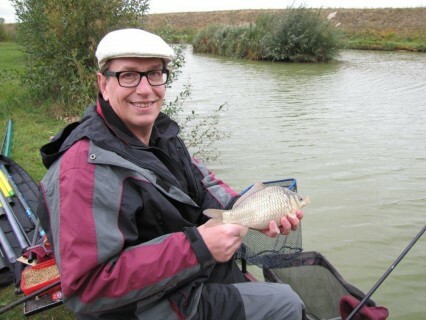 It was one of the best days fishing on natural waters of my life, not so much in the weight, but more the quality of fish, big roach and silver bream up to a pound. 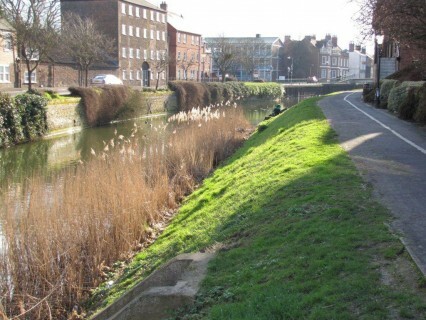 With the River Glen in full flood the match was transferred to the town stretch of the River Welland. 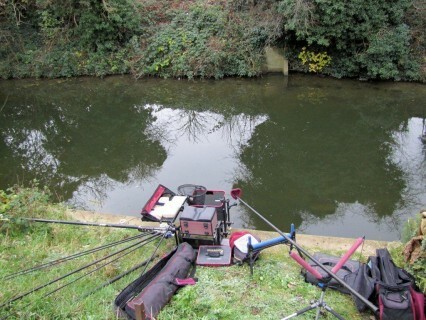 My draw was in the section below the Tax Office Bridge and I feared the worse as there were no signs of any fish moving. 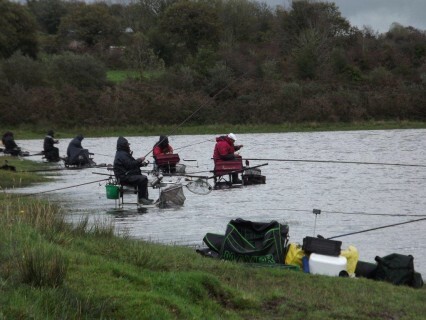 Bread is always a good bait here and that how I started, cupping in 2 balls at 9 metres plus some loose punch crumb to draw the fish. 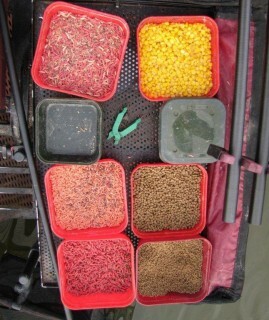 Hookbait was 3mm punched bread fished just off bottom. Within 5 minutes the float dipped and I was into my first fish: a big roach about 10 ounces. The first hour was slow with about 6 good fish, I kept cupping in a ball of crumb and loose with a few pinkies about every 15 minutes. 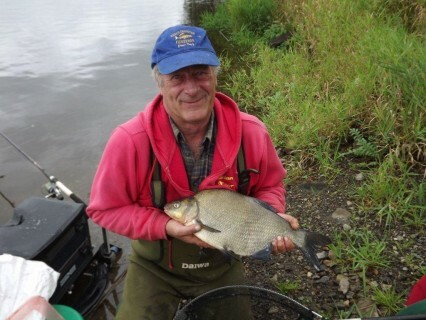 In the 3rd and 4th hour big silver bream and roach were coming to the net at regular intervals. 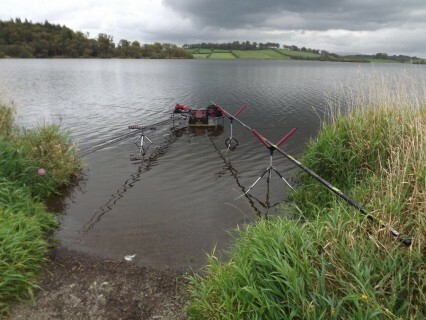 In the last hour my peg filled with small fish and it was a bite every put in. 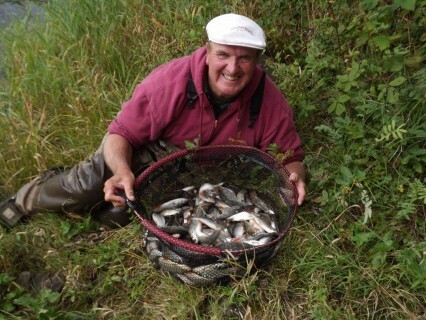 At the weigh in I had 40lbs 15ozs – one of the best ever match weights on the town stretch and one of my most enjoyable matches ever. Steve Winters (Maver Bait Tech) drew the peg on my right. There was a large gap between us because of a long bed of rushes. 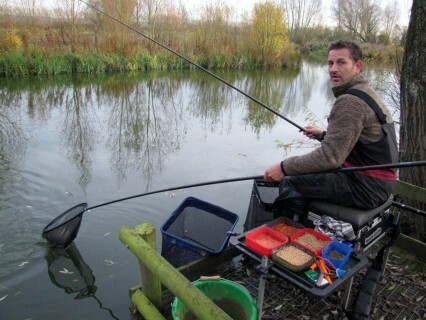 Steve started by catching a few big fish and then switched to groundbait and pinkies at 5 metres. 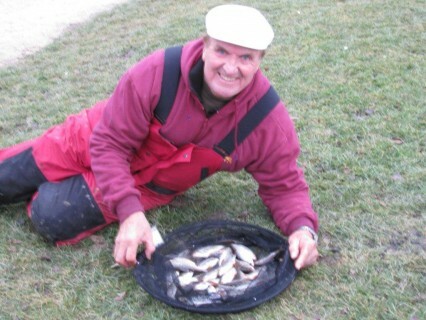 His catch consisted of about 400 roach plus a big perch of almost 3lbs, for a total weight of 35lbs 10ozs. 3rd overall with just over 20 big roach for 18lbs 13ozs was Tye Harding. 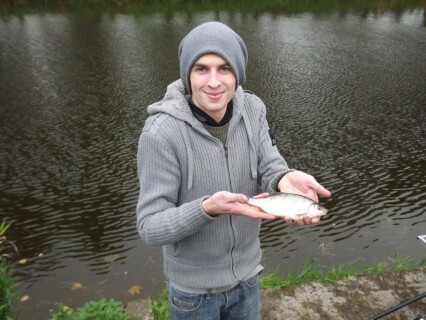 Tye also caught most of his fish on breadpunch. Maver Bait Tech Green won on the day and ended up winning the league with 10 points. 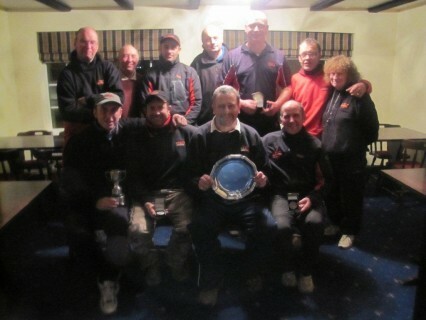 My team (Maver Fox) also had 10 points but had to settle for second place on section countback. 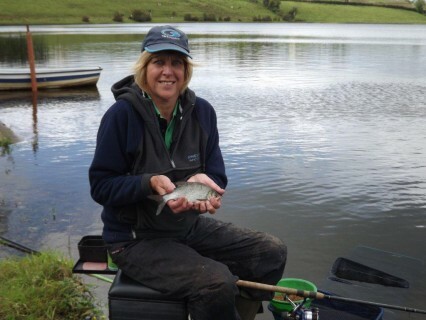 Fishing is just starting to improve although water temperatures are still low. 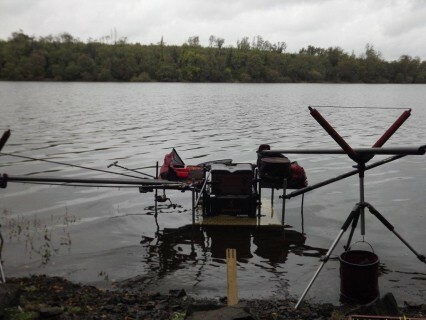 Sean Higginbottom (Maver Bait Tech) fished long pole and pellet for a brilliant weight of 52lbs 12ozs. 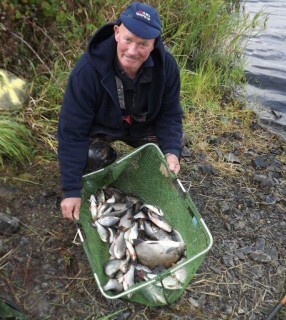 2nd overall with 29lbs was venue expert and local angler Ken Clarke. 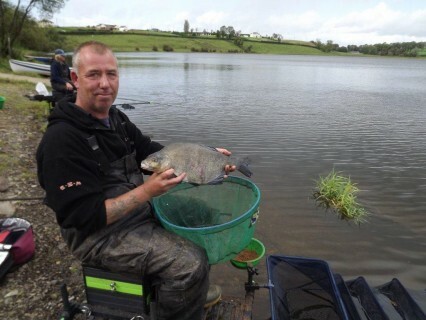 In 3rd place was Kev Hunt with 26lbs. 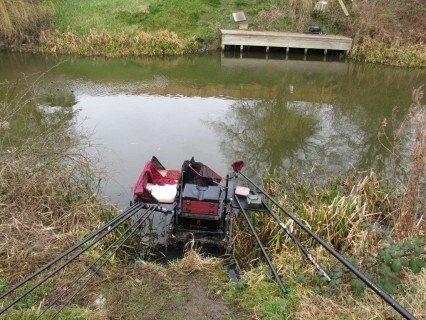 I was 5th with just over 25lbs of ide and carp on long pole and white maggot, loose feeding just a few maggots against the far bank, kept the fish coming for most of the match. 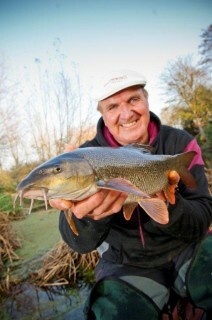 The big rudd put in an appearance from the Marina mouth on the March Bypass section and provided the top 3 overall weights. 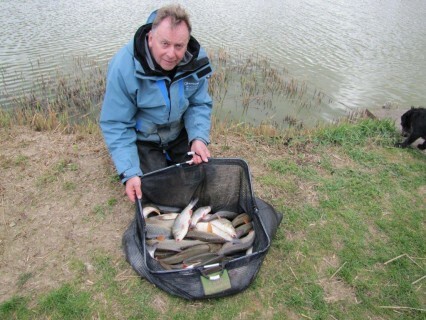 Way out in front from peg E10 was Lloyd Thompson (Garbolino Peterborough) with 17lbs 9ozs. 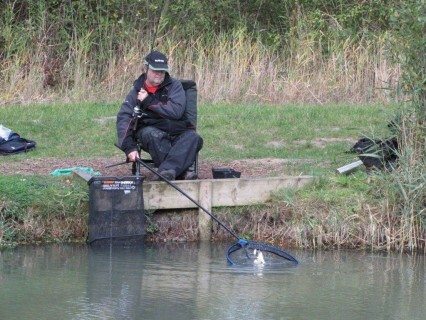 On the next peg E9 Roy Whincup (Stanjay Fox Black ) fished breadpunch at 8 meters for 13lbs 14ozs and 2nd overall. 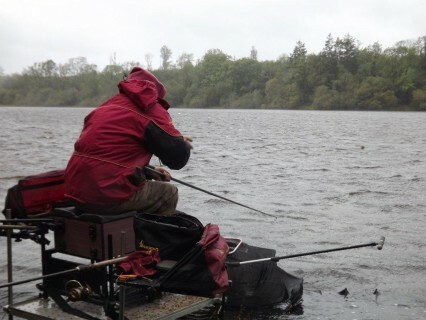 Running him very close from peg F11 was Alistair Ogilvie (Maver Bait Tech) with 13lbs 12ozs. I drew end peg 20 on the Factory Bank section at Ramsey and was not really very happy. 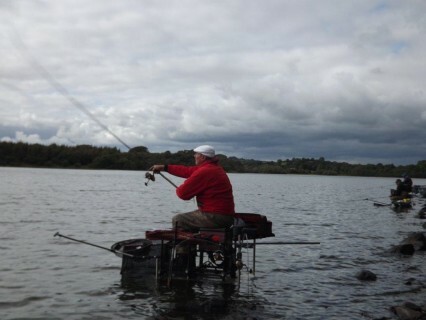 Normally the early pegs are much better, but the whole length fished really tough and I ended up winning my section and having top weight on both sections with just under 6lbs. 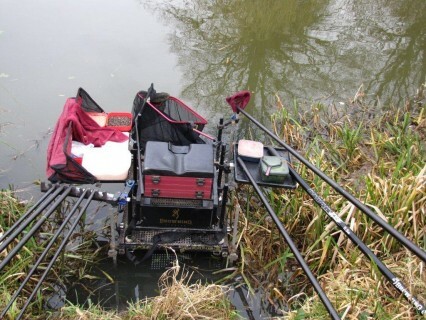 I caught most of my fish down the middle in the deepest water on groundbait (Van den Eynde Supercup) and pinkies holding back really hard with a 1 gram float and single pinkie on the hook. I was a guest for the Stanjay Fox Black team and we ended up winning the day with 24 points. 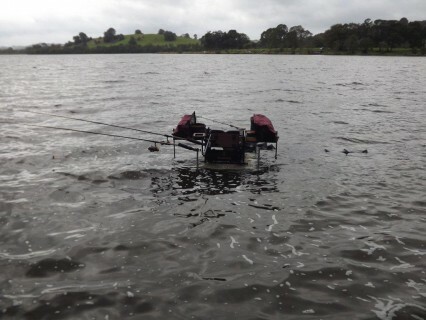 Strong cold south easterly winds made fishing very difficult. 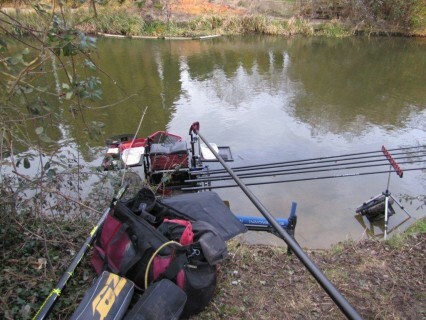 The ide are still not feeding that well as water temperatures are still low. 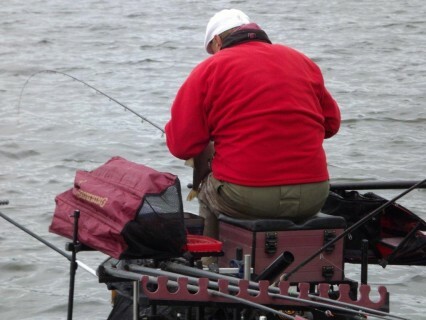 Gary Shinn drew peg 41 next to the bridge and finished 1st with 23lbs 12ozs. 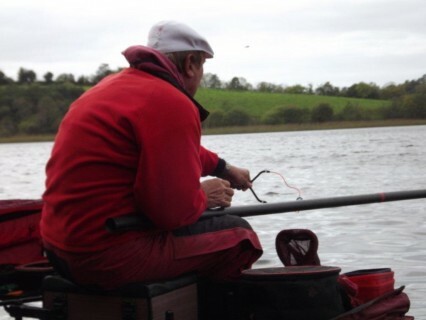 Running him close from peg 29 was Ken Clarke with 23lbs 12ozs. I finished 3rd with just over 20lbs from peg 31. 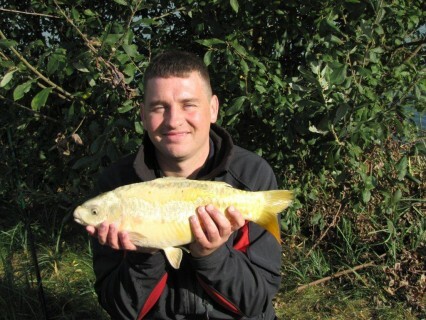 Single white maggot was the main hookbait, fished against the far bank, feeding with a small pot with just a few maggots and some 2mm Van Den Eynde hard feed carp pellets. 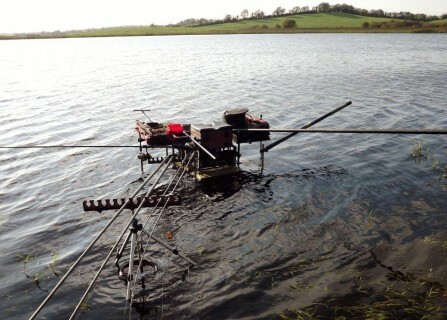 A small amount of loose feed helped keep the fish in my peg. The Old Nene at March is still in cracking form. 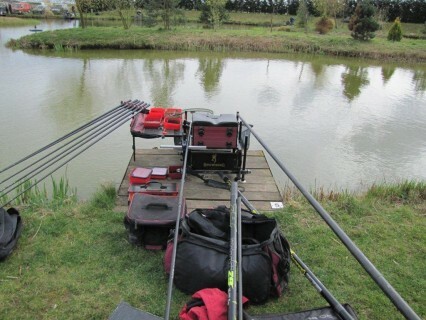 With more than 90 pegs out there was bound to be some tough areas, but in general it fished really well, with more than double figures needed to win most sections. 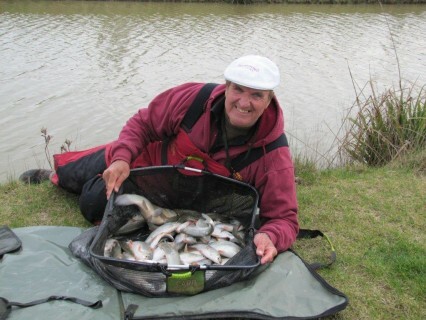 The top 3 weights all came from the fancied Nene parade section with Stuart Northrop (Browning Hotrods) coming out on top with a mainly skimmer catch of 20lbs 1oz. Steve Winters seems to love this river and was not far behind with 18lbs 9ozs. 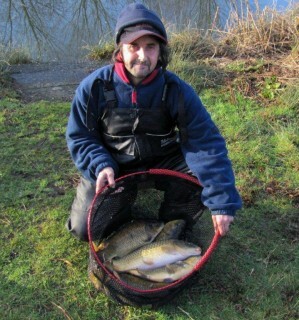 Another consistent performer on the Old Nene was Danny Mason and he finished 3rd with 17lbs 14oz. I drew a really tough section at the bottom end of the BMX track and only finished with just over 4lbs. 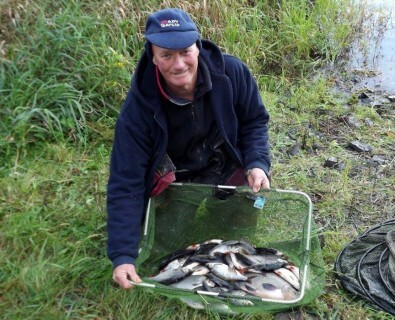 David Shailes drew the end peg 14 on Railway lake and made no mistakes, fishing long pole with pellets for a mainly F1 catch of 55lbs 8ozs for 1st overall. 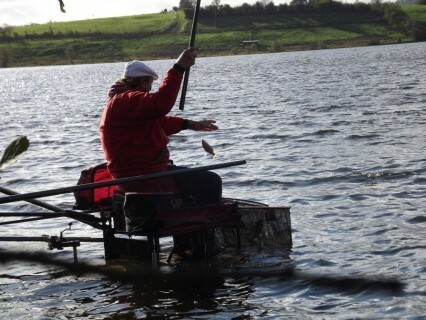 The ever consistent Neil Parkinson finished second from peg 6 on Willow lake with 50lbs 15ozs. 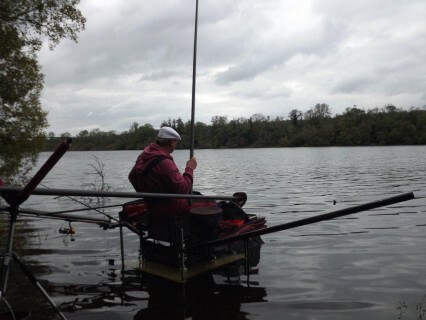 At the next peg M. McEwan weighed in 43lbs 4oz for 3rd. 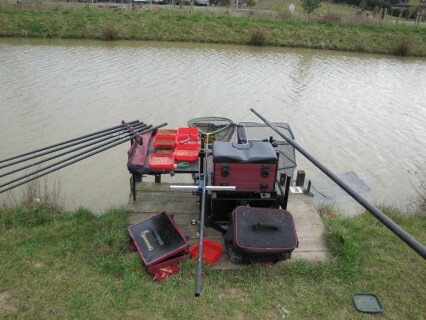 I drew a good feeder peg (12) on Railway but after an hour on the feeder for only 1 fish, I switched to long pole (17.5 meters) feeding just a few 2mm carp pellets in a small cup and using a 4mm Van Den Eynde elite expander on the hook. I started to catch a few F1’s, but they soon switched off and the last 2 hours were really difficult. 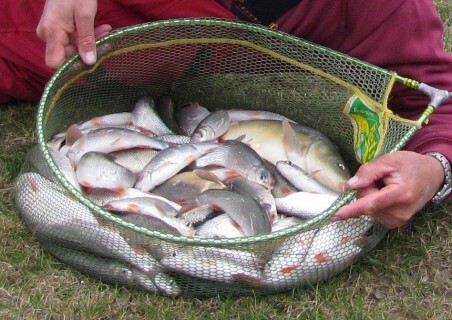 I finished up with 9 carp for just over 21lbs hard work but still enjoyable. 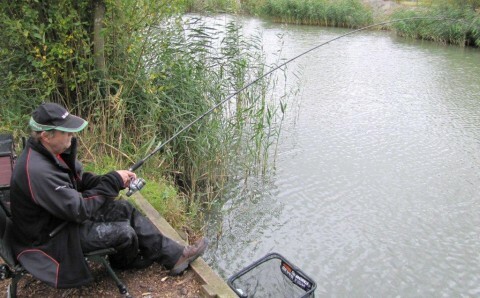 This was the 3rd round in the series John Spalton put in a brilliant performance fishing in really tough conditions to come out on top with 32lbs 14ozs John fished at 13metres tight against the far bank with a single grain of sweetcorn feeding with a small pot and 2mm carp pellets for an all carp catch. 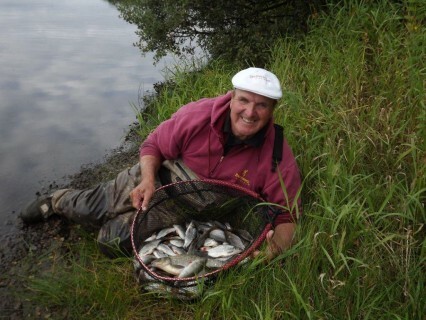 Only a peg away and running him very close was John Taylor with 31lbs 12ozs, 3rd overall with 28lbs 5ozs was Alistair Ogilvie. I had a tough match and only managed just under 7lbs for 7th in my section, not very good considering there are only 8 in a section!!! But at least the rest of my team (Maver Fox) did well with 3 sections wins and a 3rd we finished in 1st place on the day with 13 points and are now winning the league by 2 clear points with just one round to go. 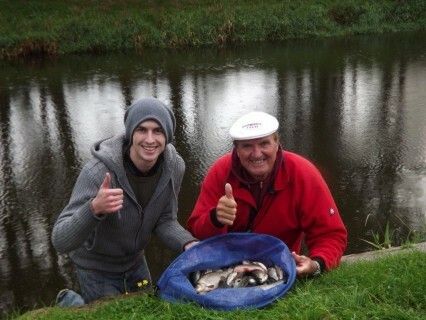 I am helping to launch the first ever Bob Nudd Angling Academy in Ireland. What a trip it promises to be! 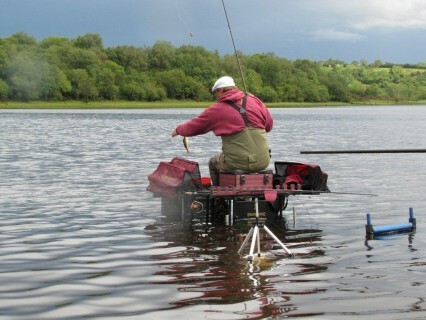 This unique holiday opportunity takes place in beautiful County Leitrim where we shall be catching fish on unspoilt waters in mid-June, probably the best time on prolific lakes brimming with fish. 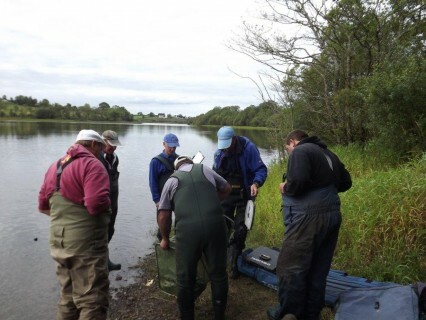 This exciting project is sponsored by Tourism Ireland and I didn’t have a moment’s hesitation when the opportunity arose to spend four days in the heart of County Leitrim’s lake land, coaching anglers and showing them the best way to catch big bream, roach, tench, hybrids and perch. “What a treat this will be”, Bob smiled. 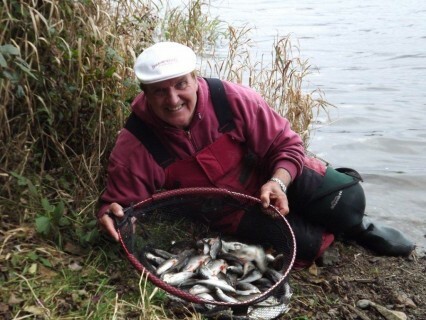 “This part of Leitrim – bounded by Carrick-on-Shannon, Ballinamore and Drumshanbo – has famous angling venues crammed with fish that have never been caught before. 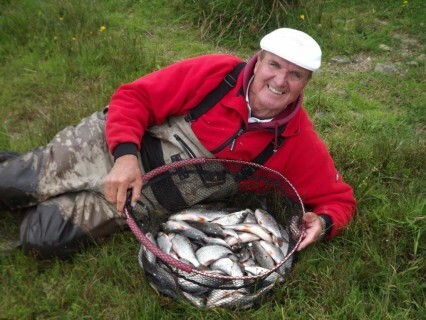 “There is no need for fishing licences, just bring your rod and tackle to catch scale-perfect fish on the best unspoilt waters in Europe and enjoy the famous Irish hospitality”. 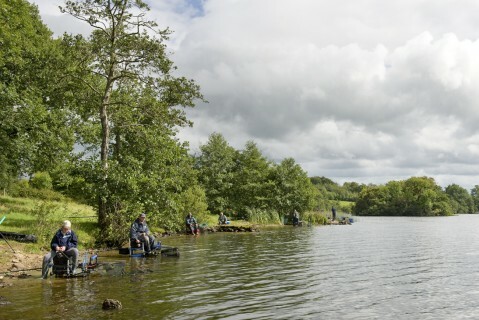 We have limited the number of places to 20 and your fishing will involve two days coaching (with a lot of one-to-one time) for each group of 10 anglers and two days on a reserved lake where there will be an informal competition with prizes for the biggest fish and heaviest catch. This is can also be an ideal holiday for the whole family. We have chosen the four-star Ramada Hotel Drumshanbo with full leisure facilities as our base in an area surrounded by lots of things to do and see. There will be a full itinerary to keep everyone in the family happy and the holiday ends with a BBQ and presentation evening. 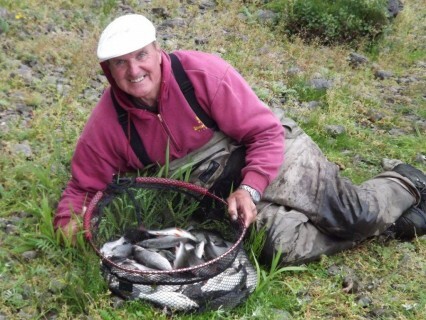 This is the link to the Academy pages on my website: http://www.activeirishangling.com/?page_id=5751. What a fantastic league match this was! 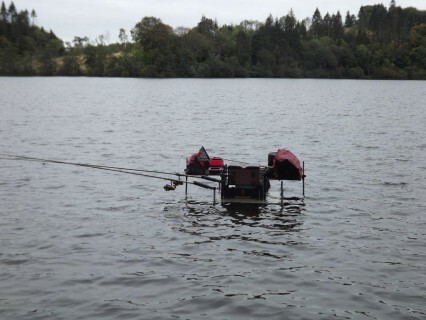 The Glen was in top form with hardly any weights below 5lbs. This was the 2nd round of 4 matches. My team has had a name change from Fenland flyers to Maver Fox. 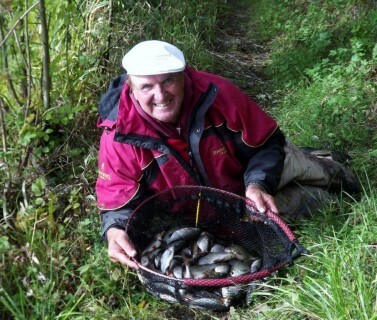 Coming out top on the day with a brilliant performance was John Taylor with 130 roach for 17lbs 15ozs. 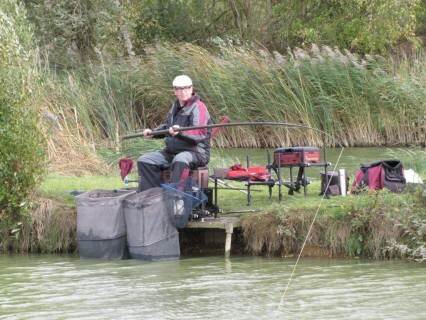 John alternated between two lines and fished one with bread the other with groundbait and pinkies. 2nd on the day with 15lbs 5ozs was Dale Stones (Gabolino Peterborough). Steve Winters was 3rd overall with 13lbs 12ozs. 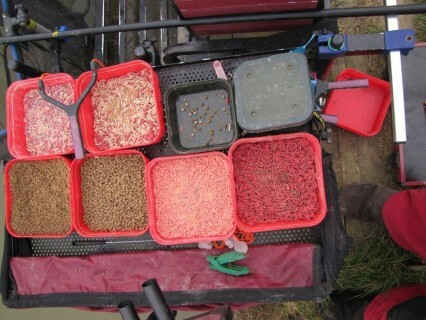 Steve balled in with groundbait and fished pinkies over the top. 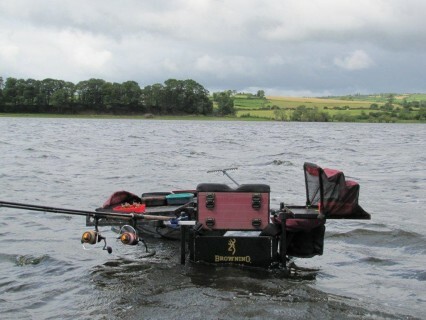 I won my section and finished 5th overall with 12lbs 2ozs and had a great days fishing getting a bite every put in, fishing a very small (2mm) punch and feeding a small ball of punch crumb with a few pinkies every 5 or 6 fish. Winning team on the day with 15 points was Garbolino Peterborough. My team Maver Fox was 2nd with 17 points, and we are now winning the overall league with 5 points. After midweek rain the river was in perfect condition for Sundays Open. 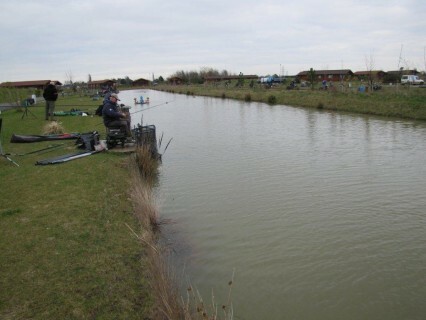 The match was a sellout with 80 anglers fishing and it needed over 20lbs to get into the top 6, with most sections being won with double figures. 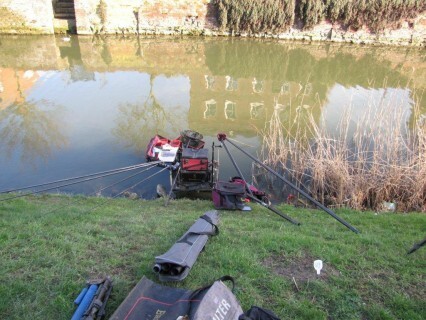 Danny Mason drew 3 pegs above the health centre bridge and fished punch for the 1st 3 hours. 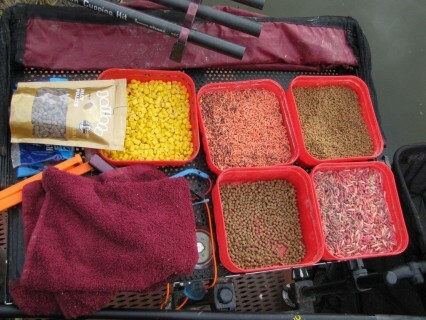 A switch to hemp in the last part of the match resulted in quality roach to 12ozs for a winning weight of 23lbs 7ozs. 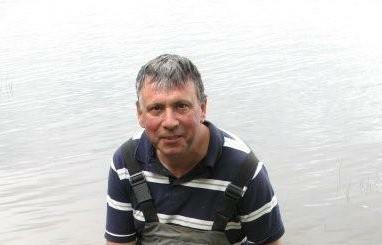 Runner up from 2 pegs below Wigstons bridge was Dave Priestley with 22lbs 13ozs. 3rd overall with 22lbs 5ozs was R. Reynolds. 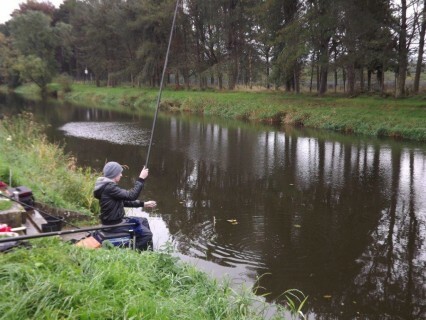 I drew in the section below the bypass and fished punch on two lines, one down the middle in the deep water and the other about a metre off the far bank. The 1st two hours were quite productive, but the action slowed and I finished with 140 roach and a few small skimmers for just under 13lbs. Browning Hotrods finished 1st on the day with an excellent team performance of 27 points, but it was not enough to secure them a place in the semi finals. Maver Bait Tech finished up winning the league with 14 points with Stanjay Gold coming 2nd on 16 points. The match was spread around several venues, Factory Bank at Ramsey, the Old Nene at Benwick, the 20ft and The Old Nene at March bypass. 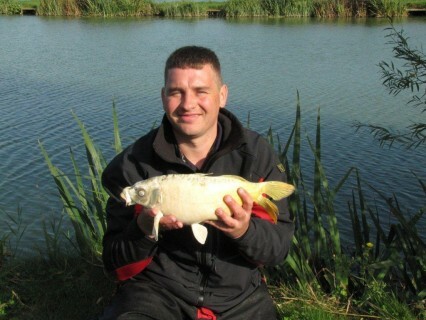 Rob Lincoln (Browning Hotrods) drew peg 2 at Factory Bank and fished pinkies over groundbait for an excellent all roach catch of 17lbs 1oz for 1st overall. 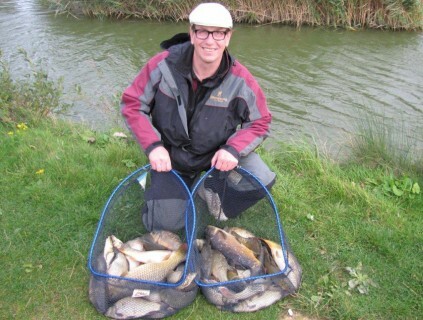 Simon Godfrey (Sensas Mark One) was in the same section and weighed 16lbs 4ozs for 2nd place. 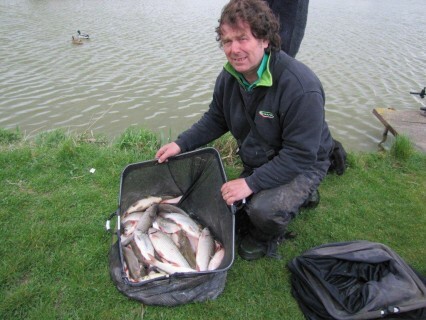 3rd overall also from the same section was Dave Thornton (Garbolino Peterborough) with 14lbs 15ozs. 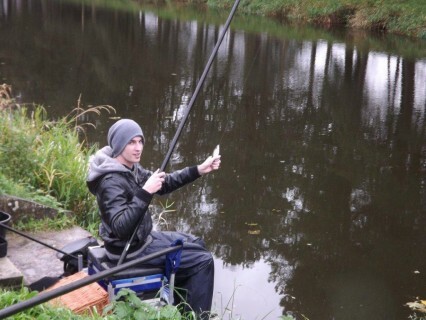 I drew in the 3rd section at Factory Bank and had a great day catching 130 roach on groundbait and pinkies for 10lbs 12ozs to finish second in my section. This was the first round of 4 matches. 9 teams of 5 competing, the venue was one of my favorites: the Old Nene at March. 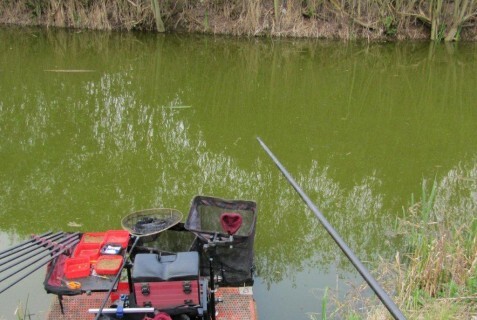 Phil Chesterton (Maver Bait Tech) drew the 1st peg below the Health Centre Bridge and came out an easy winner with over 200 small roach on pinkie over groundbait for 11lbs 11ozs. 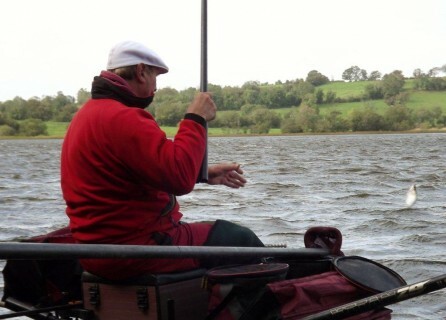 Steve Slater drew the end peg at the Bypass and finished 2nd overall with 8lbs 15ozs. 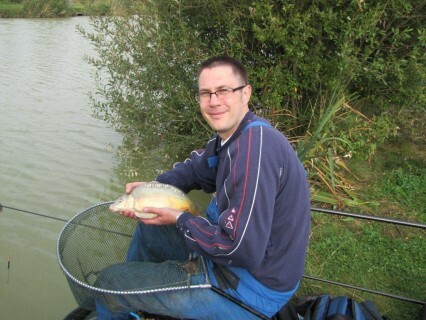 In 3rd place with 8lbs 11ozs was Chris Elsen (Lincs County). 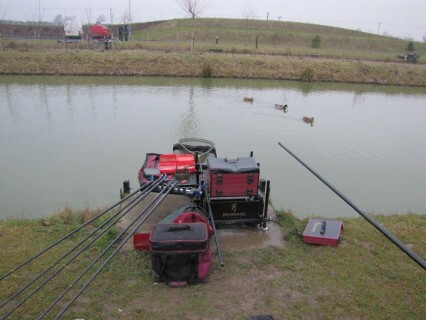 Maver Bait Tech Black came out well in front on the team event with only 9 points, 2nd with 15 points were Maver Bait Tech Green and my team (Fenland Flyers) was 3rd with 17 points.